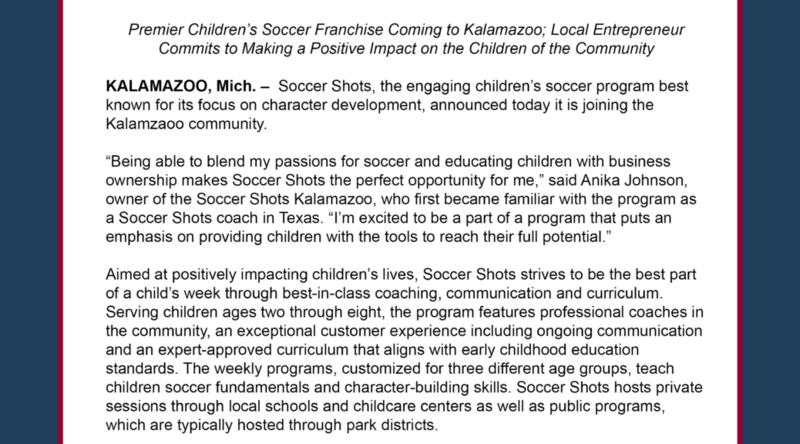 GLENVIEW, Ill. – Soccer Shots, the engaging children’s soccer program best known for its focus on character development, announced today it is joining the North Shore community. For more information about Soccer Shots of North Shore, please visit www.soccershots.org/northshorechicago or email speci@soccershots.org or apeci@soccershots.org. 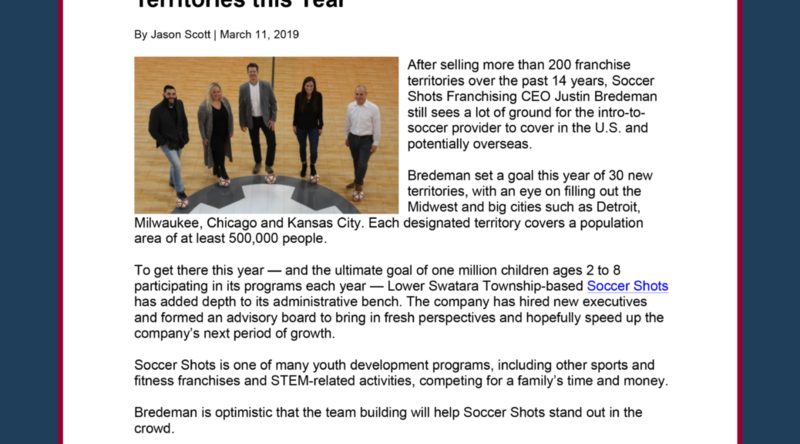 For more information about the Soccer Shots franchise opportunity, please visit https://www.soccershotsfranchising.com, email franchising@soccershots.org or call (717-616-8587). All Points PR secured a TV segment with KENS-TV for client The Camp Transformation Center. The segment featured a local franchisee who helped bust some common fitness myths and offered simple exercises that can be done at home. Coverage ran on air and online. 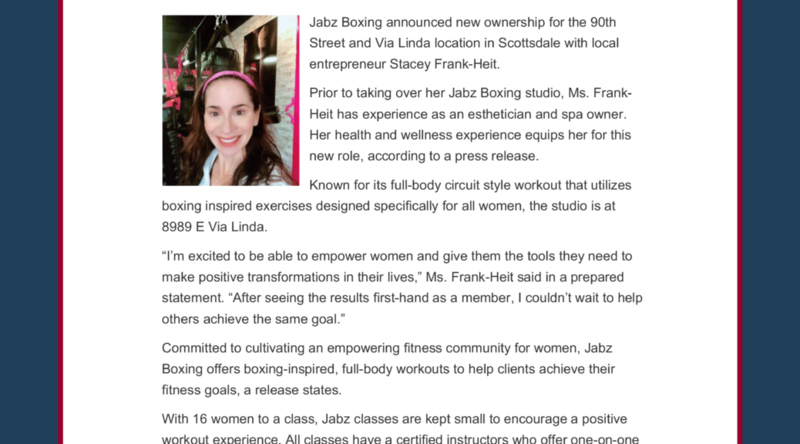 All Points PR coordinated press coverage with the Scottsdale Independent for client Jabz Boxing. The publication shared word of a new owner taking over the franchise’s location in central Scottsdale. Coverage ran online. 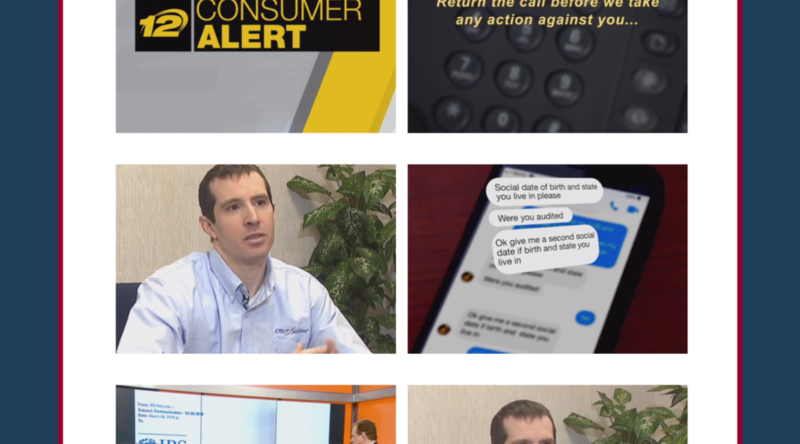 All Points PR landed a TV segment with News 12 New Jersey for client CMIT Solutions. 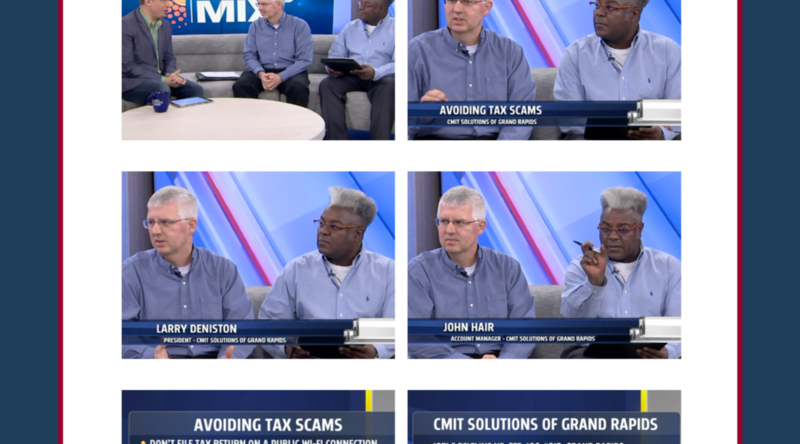 A local franchisee was featured on the channel’s Consumer Alerts segment to discuss avoiding tax scams. Coverage ran on air and online. 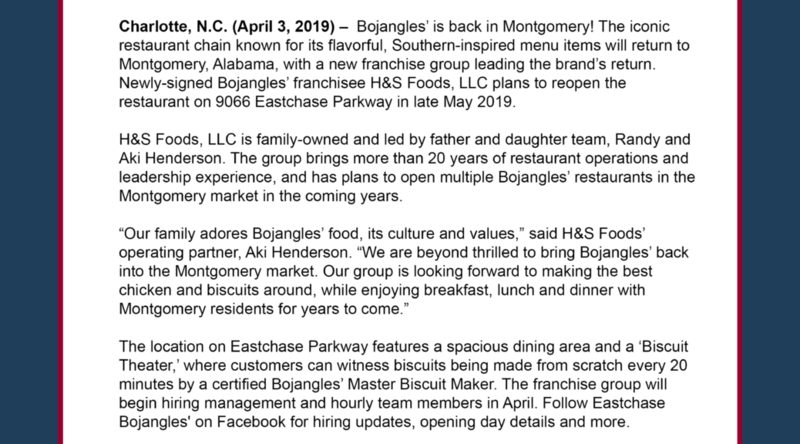 Charlotte, N.C. (April 3, 2019) – Bojangles’ is back in Montgomery! The iconic restaurant chain known for its flavorful, Southern-inspired menu items will return to Montgomery, Alabama, with a new franchise group leading the brand’s return. Newly-signed Bojangles’ franchisee H&S Foods, LLC plans to reopen the restaurant on 9066 Eastchase Parkway in late May 2019. H&S Foods, LLC is family-owned and led by father and daughter team, Randy and Aki Henderson. The group brings more than 20 years of restaurant operations and leadership experience, and has plans to open multiple Bojangles’ restaurants in the Montgomery market in the coming years. The location on Eastchase Parkway features a spacious dining area and a ‘Biscuit Theater,’ where customers can witness biscuits being made from scratch every 20 minutes by a certified Bojangles’ Master Biscuit Maker. The franchise group will begin hiring management and hourly team members in April. Follow Eastchase Bojangles’ on Facebook for hiring updates, opening day details and more. Founded in 2019, H&S Foods, LLC is a licensed Bojangles’ franchisee with plans to bring multiple Bojangles’ restaurants to the Montgomery, Ala. market. The group will proudly serve Bojangles’ menu items such as delicious chicken, made-from-scratch buttermilk biscuits, flavorful fixin’s, and Legendary Iced Tea®. Spring is officially in full swing, which means that in just a few weeks, newly-minted graduates will begin their journeys into the working world. 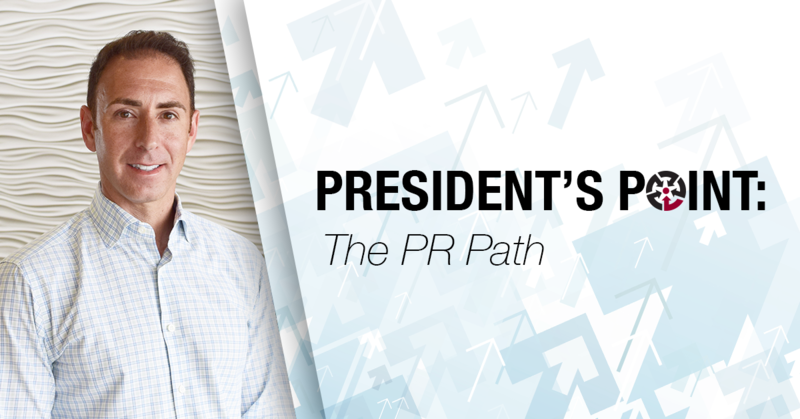 For those who will take their first steps along the PR path, I’d like to share a few things to take into consideration that will help you make a strong entrance into the field. Whether you land an in-house or an agency role, there are specific opportunities each path provides that are important for growing your experience as a PR professional. The agency path, for example, allows the chance to learn a vast amount about working in PR, as you will gain exposure to many different responsibilities, coworkers and clients. For aspiring PR professionals who want to work across multiple industries, figure out which ones you are interested in most and dig into clients of various sizes, the fast-paced agency life will help do the trick! An in-house role, in comparison, lets you focus on just one client – your company – and dive deeper into bigger initiatives. While you can find similar opportunities in an agency setting, an in-house position can also equip you to specialize in areas such as internal communications, media relations, crisis communications and more. But, no matter how you decide to embark on your PR journey, take advantage of the exposure and experience that each opportunity provides. Working as a PR professional doesn’t mean you have to be a jack-of-all-trades. While working generally across multiple roles can offer a more diversified career, there are many pros to pursuing a particular area of interest in PR to grow your expertise. This can include disciplines such as social media, content marketing, analytics, reputation management… the list goes on. Specializing in one area can also help you be more marketable down the road when pursuing roles based on an organization’s specific needs. In the ever-changing world of PR, it’s important to stay on top of the trends both in the news and within the industry. Even when you’ve found your footing on the PR path, you’ll know that there is no end to the industry knowledge you can obtain. Read a book, attend a conference, offer to assist in a project outside your department – always be thinking about ways you can refine your skills, expose yourself to new opportunities and grow as a professional. Good luck out there, graduates! Jamie Izaks is the president of All Points Public Relations, a franchise-focused PR agency based in the Chicagoland area, www.allpointspr.com. 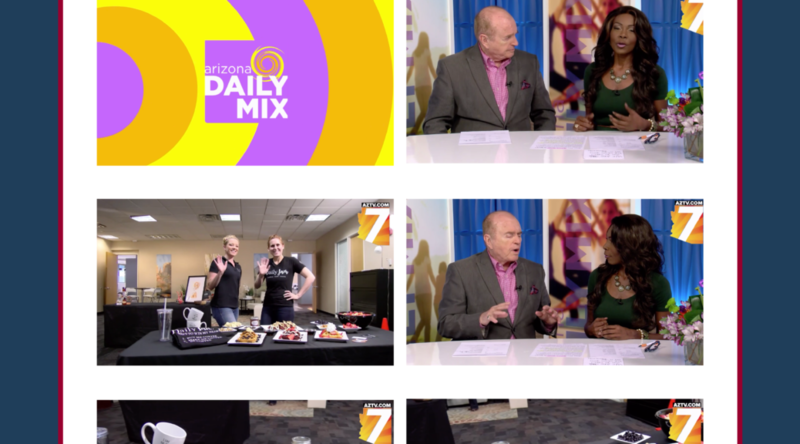 All Points PR secured a TV segment with AZTV (KAZT-TV) for client Daily Jam, which featured the red velvet waffles the franchise shared with the morning newscast team for National Waffle Day. Coverage ran on air and online. All Points PR landed social media coverage with the International Franchise Association (IFA) for client Jabz Boxing. 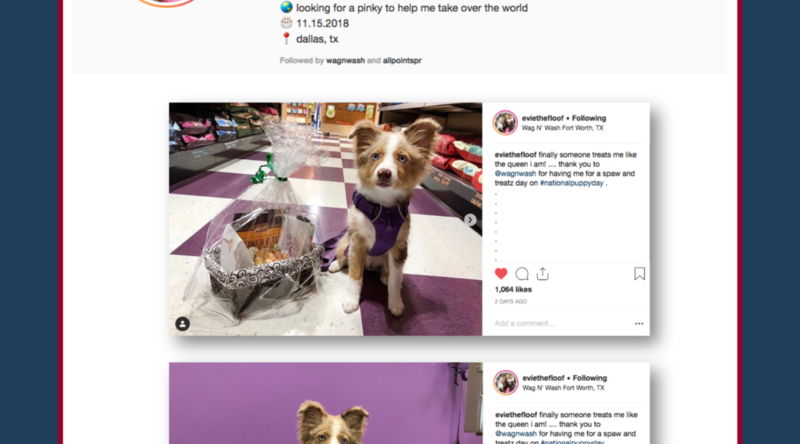 A franchisee with the brand was featured on the IFA’s Facebook, Twitter and Instagram accounts for its #FranchiseeFriday blog. All Points PR coordinated press coverage with North Forty News for client PizzaRev. 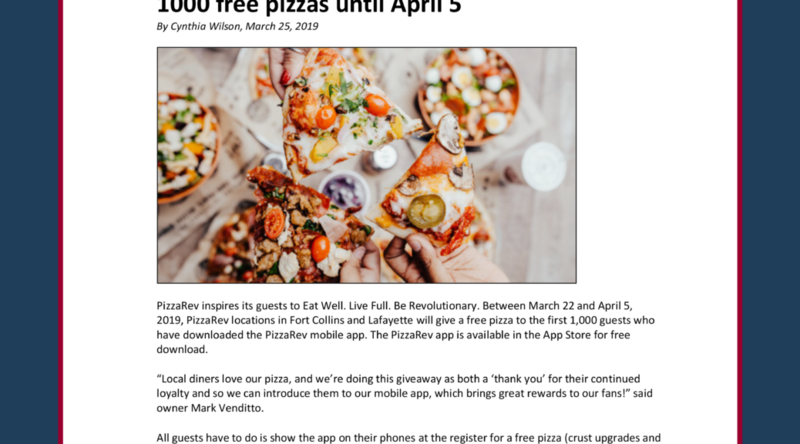 The article shared details of the franchise’s free pizza deal, offering a free pizza at the Fort Collins and Lafayette locations to the first 1,000 guests who have downloaded the PizzaRev mobile app. Coverage ran online. All Points PR secured social media coverage with KMLE County for client Daily Jam. 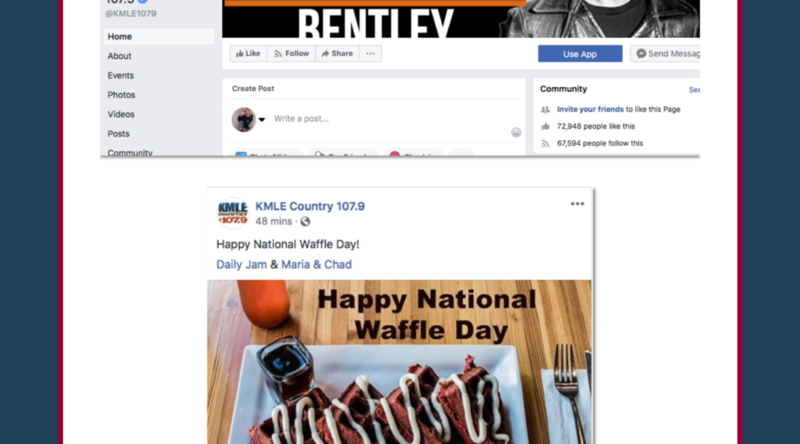 The radio station shared two photos of waffles from Daily Jam on National Waffle Day with more than 67,000 followers. 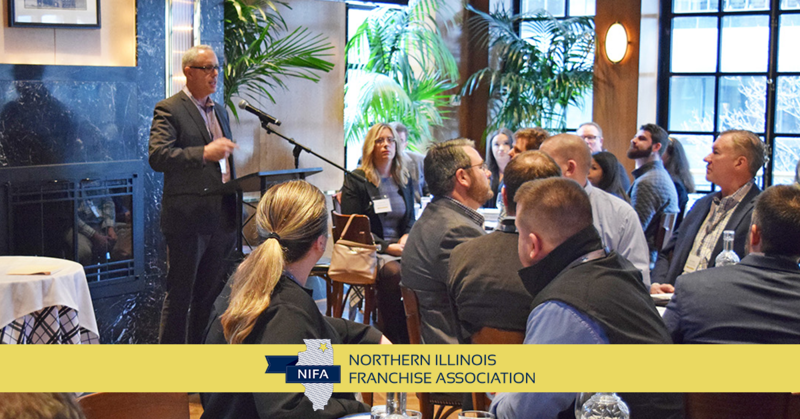 The Northern Illinois Franchise Association (NIFA), co-founded by Jamie and Lauren Izaks and Andrew Bleiman, recently hosted its 2019 March Luncheon at LUXBAR in Chicago. The Luncheon allows NIFA to continue its work educating the Chicagoland community about the most pressing franchise-related topics of the day. With nearly 50 guests in attendance, the March Luncheon featured Stuart G. Berman, CFE, CAMS, Director of Forensics & Valuation Services at BKD, who led a discussion focused on Preventing Employee Fraud, Theft and Embezzlement: Best Practices, Tips and Strategies. The event kicked off with words from event sponsors Patriot Software and BMO Harris Bank, who shared their ties to such a relevant topic in the franchising industry. Berman began his presentation by discussing recent trends in workplace fraud and included interesting facts and statistics from the 2018 Report to the Nations on Occupational Fraud and Abuse. Stuart explained several alarming reasons for committing fraud in the workplace, such as the thrill associated with getting away with the crime. Tenure is also a major trend in committing fraud, as Berman explained that the longer a person works somewhere, the bigger crime they are likely to commit if participating in fraud. Guests were also very interested to learn more through the real life case studies that Berman presented, offering an interactive and thoughtful experience to learn more about employee fraud, embezzlement and how to mitigate risk. Considering the recent newsbreak of the college admissions cheating scandal, referred to as “Operation Varsity Blues,” this presentation came at a very relevant time beyond the workplace and franchising industry as well. In addition to the discussion and the delicious meal of gourmet burgers and salad served, attendees enjoyed complimentary valet parking sponsored by All Points PR and Marks & Klein, as well as lively networking sessions before and after the presentation. Stay tuned for details on the upcoming 2019 May NIFA Luncheon, and visit www.northernilfranchise.org for more information about the organization. All Points PR secured social media coverage with Instagram blogger Phoebe Davis (@flexingphoebs) for client Jabz Boxing. 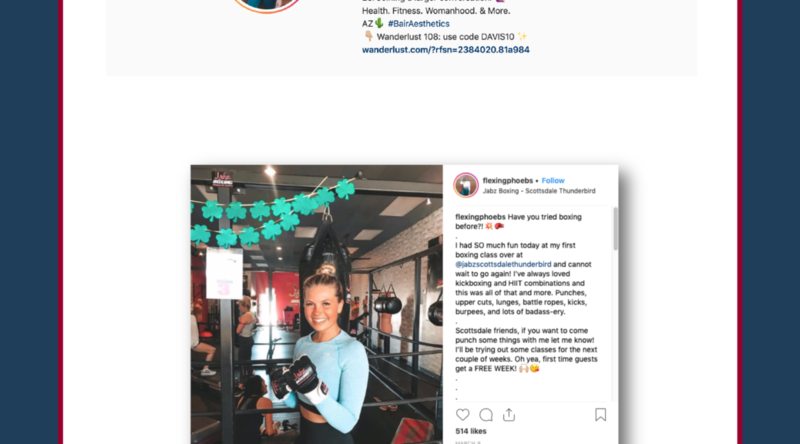 The blogger posted a picture of her participating in a boxing class at the franchise’s Thunderbird location, discussing details of the workout for her followers. All Points PR coordinated press coverage with the Orlando Weekly for client Kona Ice. 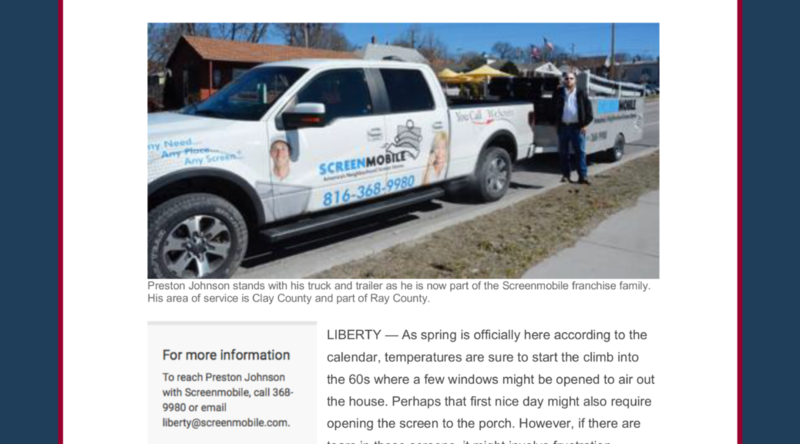 The article discussed the franchise’s new business in Hunter’s Creek while featuring details about the truck’s “Flavorwave” offerings and the philanthropies the new franchisees plan to donate a portion of their proceeds to. Coverage ran online. All Points PR secured a TV segment with Fox 29 Philadelphia for client Jabz Boxing. The segment featured the Voorhees location and its Heart Effect charity class, which was recently hosted to benefit the Phoenix Children’s Hospital’s Heart Center and cardiac 3D print lab. Coverage ran on air and online. All Points PR coordinated press coverage with the Orlando Business Journal for client Take 5 Oil Change. The article shared word of the franchise’s plan to invest $15 million into up to 20 new orlando locations, interviewing Director of Business Development for Driven Brands Logan Sumner about the decision to target Orlando. Coverage ran online. For more information about Soccer Shots of Kalamazoo, please visit https://www.soccershots.org/kalamazoo/ or email ajohnson@soccershots.org. 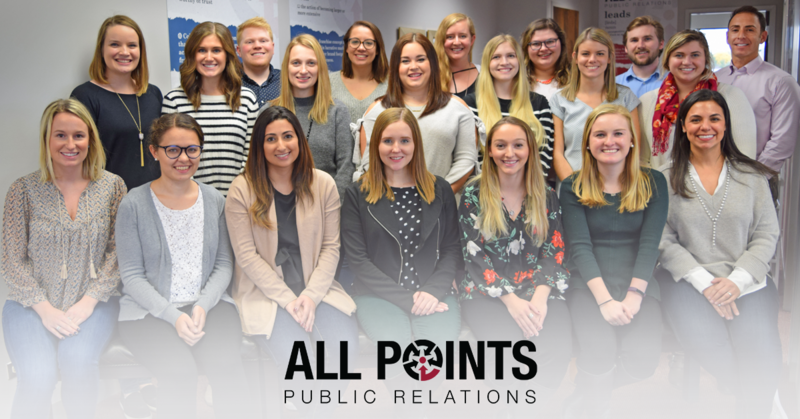 As the world of public relations continues to evolve, the All Points PR team continuously prioritizes staying on top of the trends – especially in today’s digital landscape. 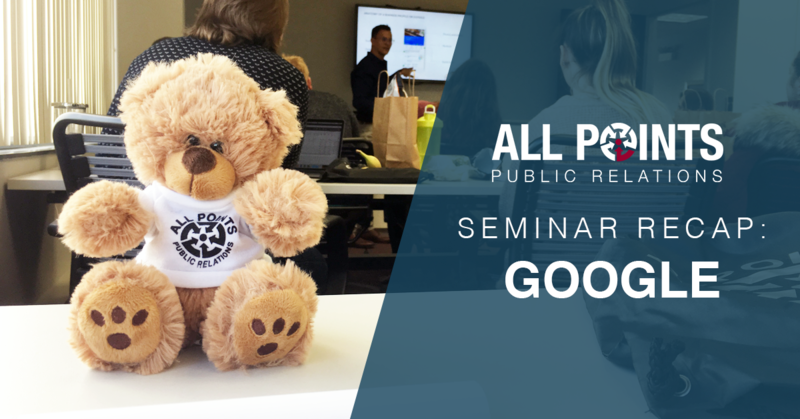 All Points recently welcomed Google representative and Sales Leader Eric Hubbs to lead a seminar in an effort to maintain this commitment and help fine-tune our team’s skills. With the change from Google Plus to Google My Business, the All Points team aims to focus on Google’s essential business tools and how they can be utilized to help improve the franchising industry. Hubbs’ presentation entailed an overview of Google My Business, as well as the nitty-gritty details involved in getting the most out of the platform for franchisors and franchisees. Google My Business allows organizations to share posts that offer a more informative and engaging experience for viewers – we look forward to leveraging this feature for our clients. Ultimately, the presentation boiled down to one principle that resonates deeply with All Points: it’s all about telling your story. Our monthly seminars serve to promote ongoing education and refinement of skills, motivating and inspiring our employees through relevant topics and exciting information. We thank Eric Hubbs for taking the time to visit our office and discuss the innovative developments taking place with Google’s business tools. Be sure to check out All Points on Facebook and Twitter to hear about our latest seminars, and follow along on Instagram to keep up with the office! PHOENIX – Jabz Boxing, a full-body circuit workout that utilizes boxing inspired exercises designed specifically for women, announced its partnership with Girls on the Run serving Maricopa and Pinal counties, a nonprofit physical activity-based, positive youth development (PA-PYD) program that inspires girls in 3rd through 8th grade to be healthy, joyful and confident. 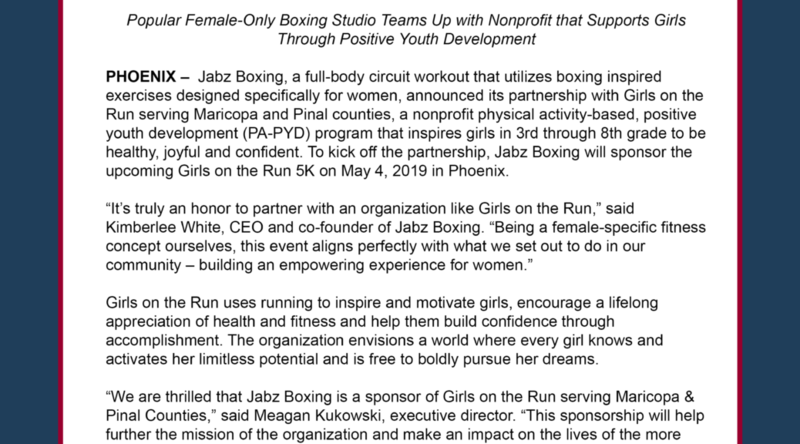 To kick off the partnership, Jabz Boxing will sponsor the upcoming Girls on the Run 5K on May 4, 2019 in Phoenix. Girls on the Run uses running to inspire and motivate girls, encourage a lifelong appreciation of health and fitness and help them build confidence through accomplishment. The organization envisions a world where every girl knows and activates her limitless potential and is free to boldly pursue her dreams. Founded in 2012 in Scottsdale by Len Hayko and Kimberlee White, Jabz Boxing took Arizona by storm, quickly becoming the leading boxing-inspired fitness concept in the area due to its high intensity, results driven workouts and strong sense of community. Franchising began in 2013, and Jabz Boxing has already grown to a total of 20 Arizona locations and one location in the Philadelphia metro area. Now, Jabz Boxing plans to increase its footprint across the country, entering key markets such as Las Vegas and Denver, where it will bring women an empowering community and energetic workout experience. For more information on Jabz Boxing visit https://www.jabzboxing.com. Founded in 2004, Girls on the Run serving Maricopa has served more than 12,000 local girls and their families. Over the course of the ten-week program, girls in 3rd-8th grade develop essential skills to help them navigate their worlds and establish a lifetime appreciation for health and fitness. The program culminates with girls positively impacting their communities through a service project and being physically and emotionally prepared to complete a celebratory 5K event. With the largest 5K series by number of events in the world, Girls on the Run hosts more than 330 5Ks per year. Girls on the Run was recently included as a top research-based program in a Social-Emotional Learning Guide developed by researchers at Harvard University and has been recognized by the National Afterschool Association (NAA) as one of the most influential after-school programs. Visit gotrmc.org to learn how to get involved. 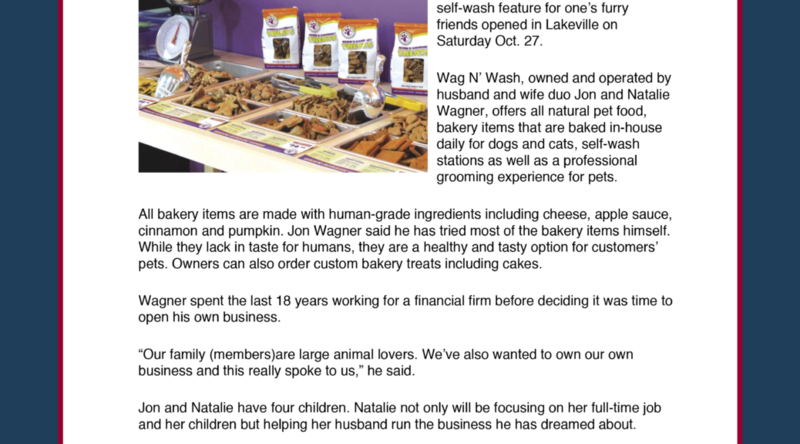 All Points PR gained press coverage with The Tribune for client Wag N’ Wash Natural Food & Bakery. 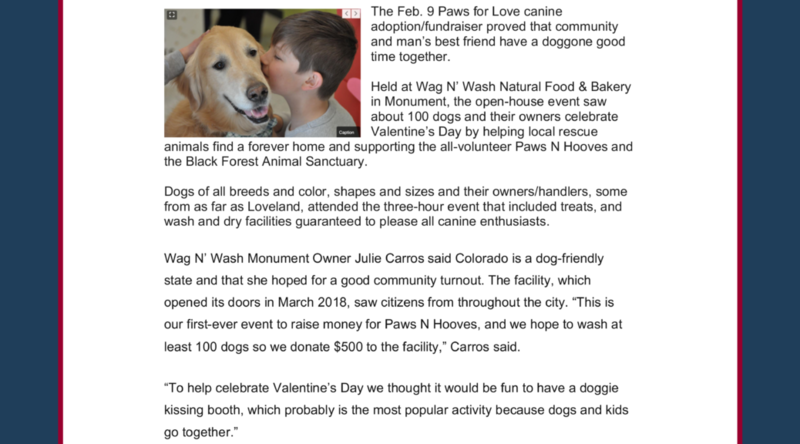 The article highlighted a local franchise’s “Paws for Love” fundraising event for Paws N Hooves and the Black Forest Animal Sanctuary. Coverage ran online. All Points PR coordinated press coverage with The Detroit News for client Take 5 Oil Change. The article shared the franchise’s plans of opening 45 Michigan centers and looking toward the Metro Detroit market. Coverage ran in print and online. All Points PR secured press coverage with AZ Central for client Jabz Boxing. 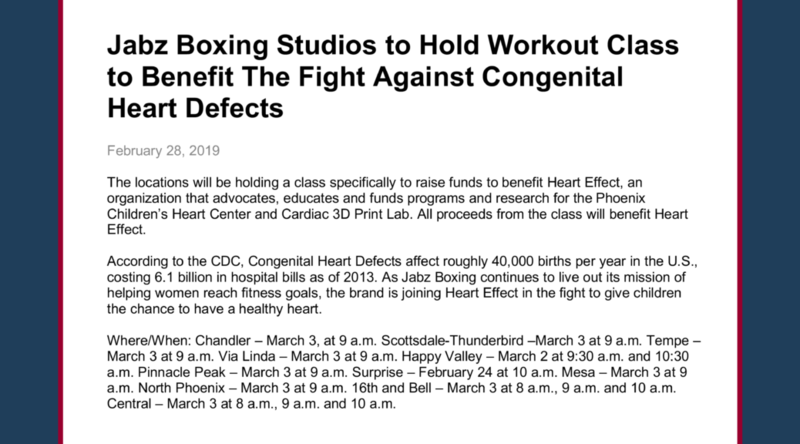 The article shared the word of the franchise’s Heart Effect charity class event that aimed to raise money for the Phoenix Children’s Heart Center. Coverage ran online. All Points PR landed trade coverage with Franchise Times for client Wag N’ Wash Natural Food & Bakery. 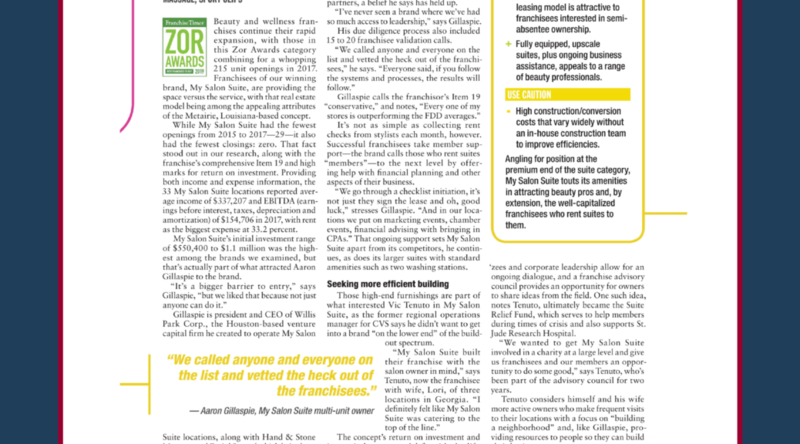 The magazine’s “Living Large” article shared a quote from the franchise’s President Rob Flanagan on building a better franchise. Coverage ran in print and online. There are few things that are more satisfying in public relations than landing coverage from a great pitch. However, making your way past flooded inboxes, voicemails and grumpy reporters can put a damper on your efforts. 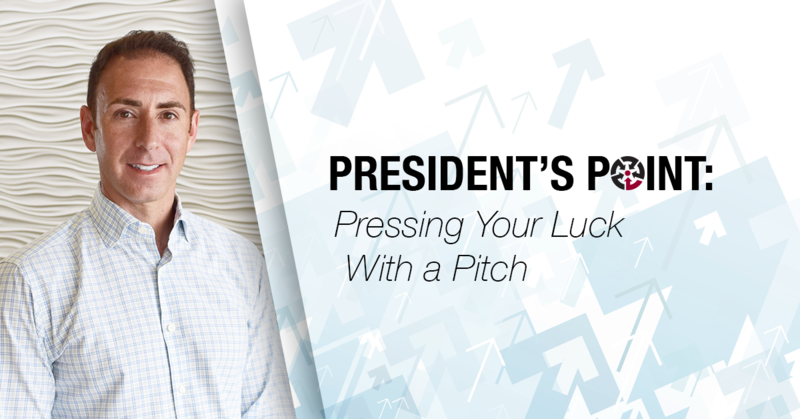 In a world where attention spans are thin and patience can wear even thinner, here are a few ways to find more luck when pitching the media. Reporters have a limited amount of time in the day to read, listen and respond to pitches, so it’s important to stay on top of your game. And, most importantly, get to the point. When emailing reporters, craft an appealing subject line that you can imagine reading as the headline of your story. Keep it short, sweet and punchy – don’t be afraid to make it shocking when appropriate. Ensure you’re personalizing the pitch in the body of the email. Highlight its key value to the reporter and his or her audience in an interesting and succinct way – again, thinking in headlines. This can help you strike gold after getting the reporter to simply open the email. It’s essential for PR professionals to stay up-to-date on current events and breaking news stories to understand when it’s a good time – and not a good time – to pitch certain reporters and markets. You don’t want to pitch reporters about vacation travel tips when they’re in a middle of a hurricane. While politics and weather tend to dominate the news, don’t count out pop culture as breaking news. If you can tie a connection around the latest Hollywood hit or celebrity birth announcement into your pitch, you can help it gain attention and relevant traction rather than getting buried in the pile of pitches sent to reporters each day. If you feel like you’re not having any luck with email or phone pitching lately, there’s another viable option that’s right underneath your fingertips – social media. Sites like Twitter are crawling with journalists looking for sources to contribute to their next blog post or article, and when you’re searching in the right place, your pitch just might get lucky. Pick up your cell phone or hop on the web and use hashtags to your advantage. Searching tags on Twitter such as #journorequest enables you to surf a myriad of recent requests from writers who are looking for a story you may be able pitch. This allows you to reach the journalist directly and in a setting where you already know what they’re looking for. This time of year is one of the most exciting for franchising. Several members of the All Points team headed to Las Vegas to participate in round table discussions, educational seminars and plenty of networking time at the International Franchise Association 2019 Convention. 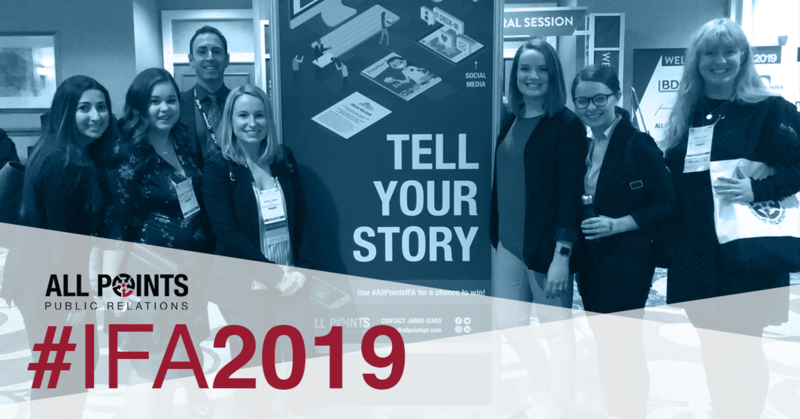 The team brought back a lot of great takeaways from the convention – check out what they had to say about IFA 2019! Jamie: The IFA Convention is our time to be on stage… time to make every minute matter in the limelight. What I am most excited about taking away from the convention is seeing just how inspired, motivated and attentive our team was to represent us in the most positive way to the franchise industry while in the spotlight in front of prospective clients, current clients and networking partners. No matter the aspects of the convention, our team was dialed in and focused. That meant the most to me. Bailey: My favorite part of the IFA was participating in the roundtables. I love hearing what new and longtime franchisors are doing to grow. It’s great getting to share my expertise and learnings from the agency with them. It’s also fun to be with so many of our current clients all in one place. Sydney: One of my favorite parts about the IFA was getting the opportunity to learn about and connect with new and different brands within the franchising industry. The industry is massive, so the possibilities for franchise concepts are endless, and it’s fascinating to learn more about so many of them. Gillian: One of my favorite parts of IFA this year might seem simple, but it really made an impact for me — meeting our clients in person. Since so many of our client communications take place via emails and phone calls, it’s easy to forget the simple difference speaking to someone face to face can make. I felt like I was able to make personal connections with clients I hadn’t gotten the chance to connect with as closely before, and I left IFA re-energized and motivated to share that same energy with the team. Barbara: My favorite part of the convention was seeing our IFA campaign come to life! 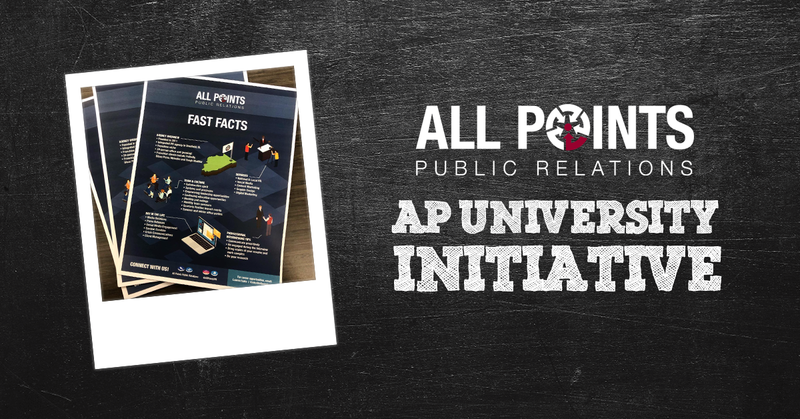 From the print and digital ads leading up to the convention to seeing the sponsor towers in person, the All Points presence at the convention was felt far and wide. Jenna: The IFA was an amazing learning experience that gave me great a perspective on the industry. I was able to see franchising as a bigger picture, meet key players in the organization and build relationships with current and potential clients and networking partners. Check out our Facebook and Instagram pages for even more information and photos from All Points at the IFA Convention! 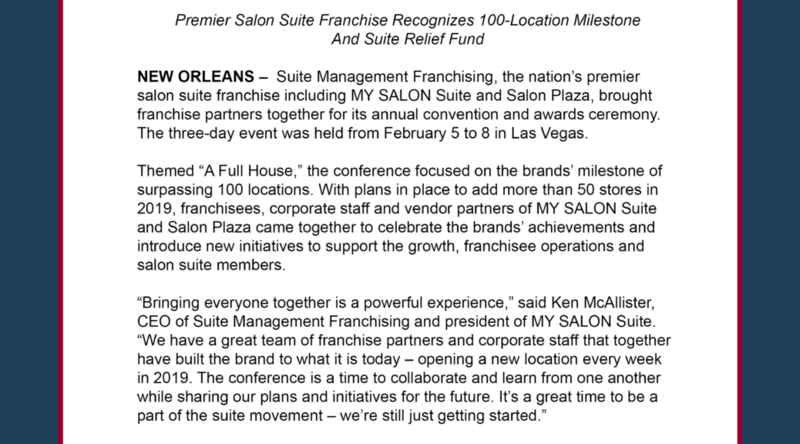 NEW ORLEANS – Suite Management Franchising, the nation’s premier salon suite franchise including MY SALON Suite and Salon Plaza, brought franchise partners together for its annual convention and awards ceremony. The three-day event was held from February 5 to 8 in Las Vegas. Suite Management Franchising also recently introduced a new initiative – Suite Relief Fund. Franchise partners of MY SALON Suite and Salon Plaza have an opportunity to give back to the community by opting into the Suite Relief Fund, which partly benefits St. Jude Children’s Research Hospital to give back and help families in need. Since November 2018, Suite Management Franchising has donated more than $50,000 to St. Jude. Part of the Suite Relief Fund will also go to support Salon Plaza and MY SALON Suite’s members in times of disaster or tragic life events. To learn more about Suite Management Franchising, please visit: www.suitemanagementfranchising.com. For more information about Suite Management Franchising, visit www.suitemanagementfranchising.com. To learn more about MY SALON Suite and Salon Plaza, visit www.mysalonsuite.com and www.salonplaza.com. All Points PR gained a TV segment with Let’s Talk Live for client Two Maids & A Mop. 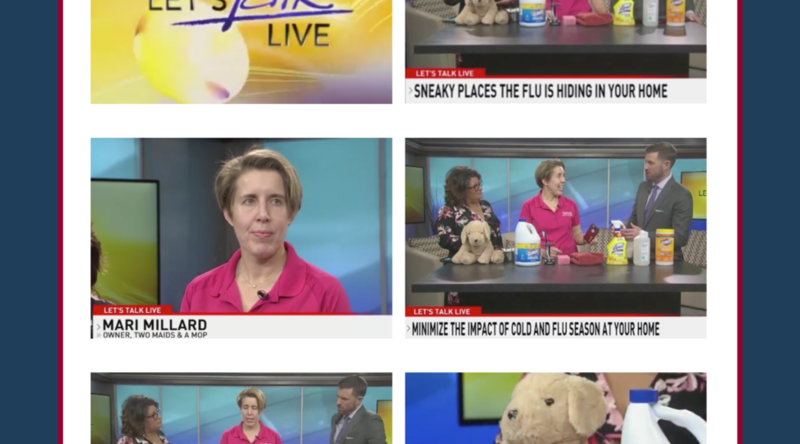 The segment featured a franchise owner who discussed sneaky places the flu can hide in homes, and how the impact of the cold and flu season at home can be minimized. Coverage ran on air and online. All Points PR coordinated trade coverage with Franchise Times for client MY SALON Suite. The franchise recently won the Zor Award for the Pamper Me category, beating out industry competitors. The publication also connected with two franchise owners, who spoke about real estate, existing franchisee support and upscale amenities that help attract members. Coverage ran in print and online. All Points PR landed a TV segment with Fox 10 KSAZ-TV for client Jabz Boxing. The segment featured the franchise’s Co-Owner Kimberlee White, who discussed the upcoming Heart Effect charity classes that are taking place at all locations in March. These classes will benefit local programs and research for a children’s heart center in Phoenix. Coverage ran on air. All Points PR secured trade coverage with Franchise Times for client Huddle House. The article shared the word of the franchise’s new, smaller store footprint, which is designed to elevate the brand’s presence across the country and attract franchisees at a lower investment. Coverage ran online. 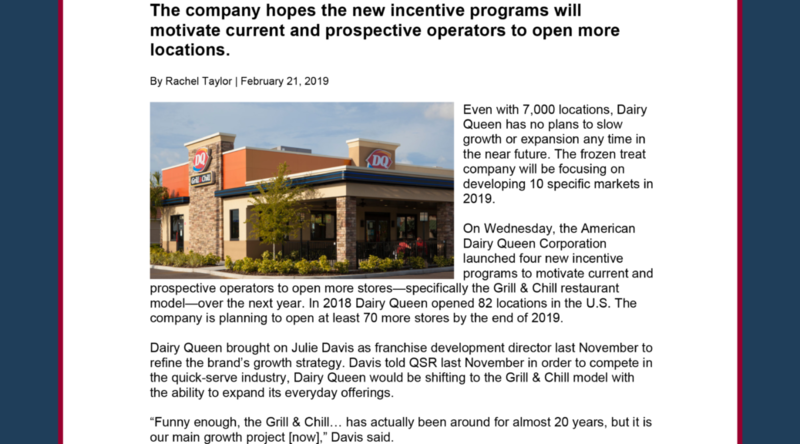 All Points PR secured trade coverage with QSR Magazine for client Dairy Queen. The article shared details of the franchise’s growth plans, highlighting the brand’s new incentive programs and outlining the target markets for the year ahead. Coverage ran online. 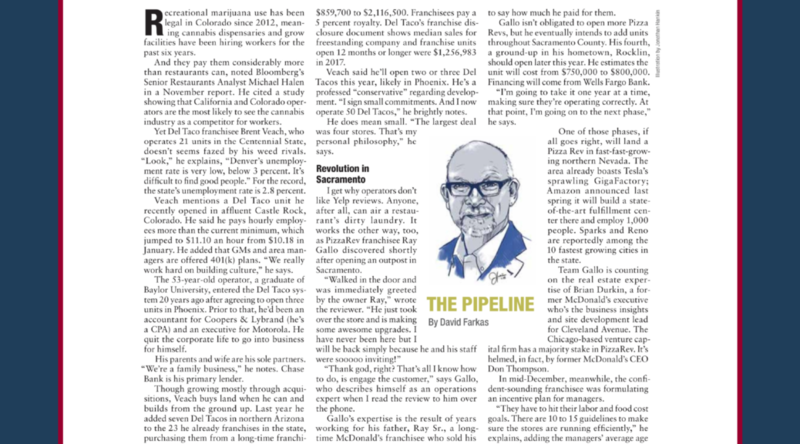 All Points PR gained press coverage with the South Florida Business Journal for client Dale Carnegie. 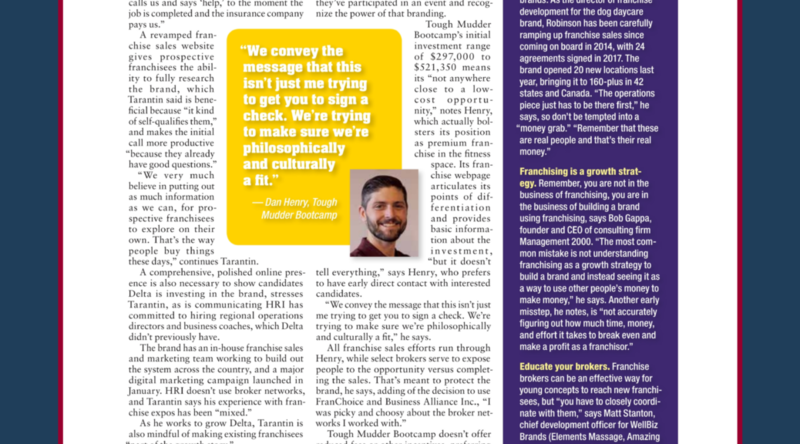 The article shared the thoughts of a local franchise partner who spoke about how to win friends and influence people, with a focus on southwest Florida. Coverage ran online. 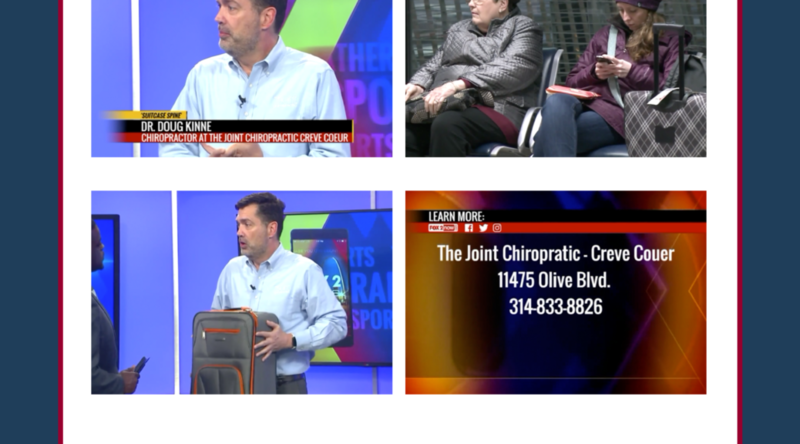 All Points PR landed a TV segment with FOX 19 for client Junk King. 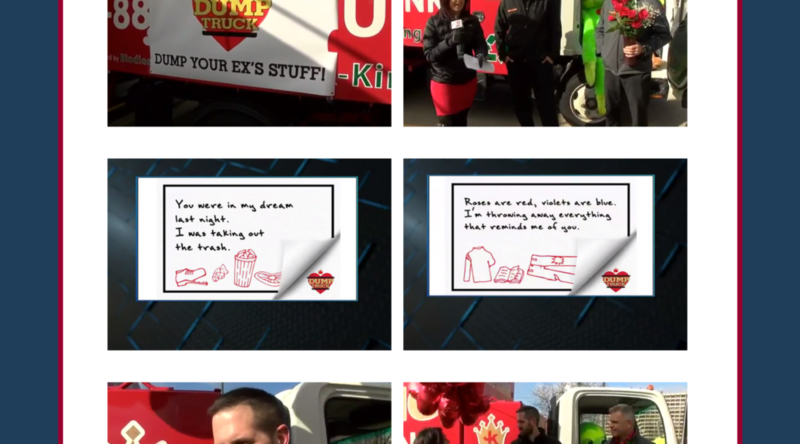 The segment featured a Cincinnati franchise location that participated in a Valentine’s Day event where people could dump their ex’s stuff for free. Coverage ran on air and online. All Points PR coordinated press coverage with Sheboygan Press for client Marco’s Pizza. 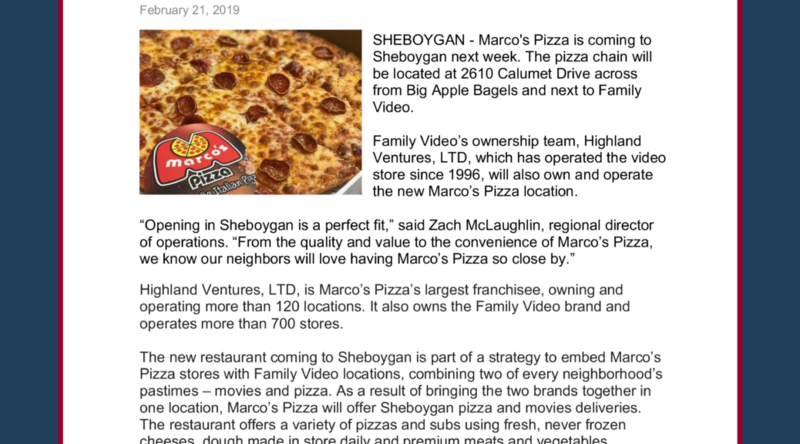 The publication shared details of the pizza franchise’s new location in Sheboygan, part of a strategy to embed Marco’s Pizza stores with Family Video locations. Coverage ran online. 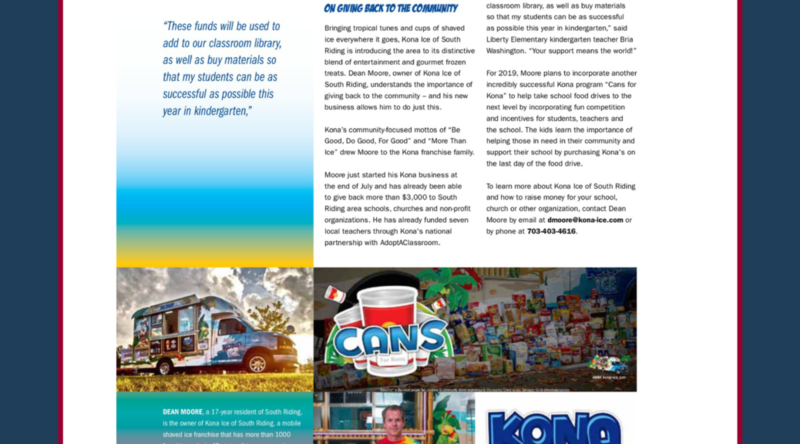 All Points PR landed press coverage with South Riding Magazine for client Kona Ice. The article featured the owner of Kona Ice of South Riding, who shared his plans for giving back to the community in 2019. Coverage ran online. 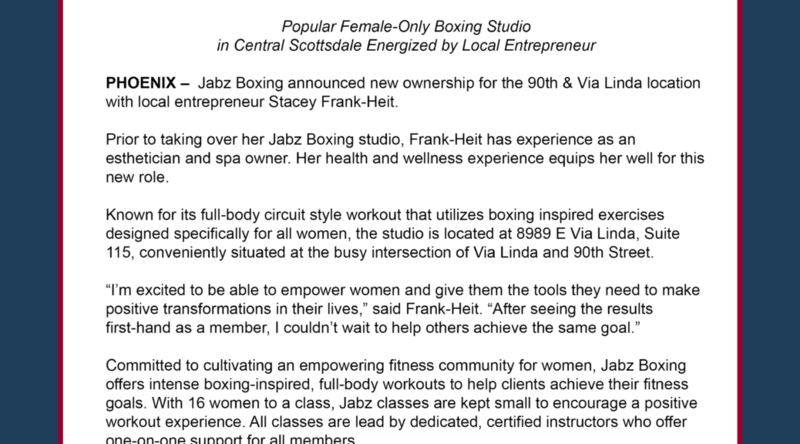 PHOENIX – Jabz Boxing announced new ownership for the 90th & Via Linda location with local entrepreneur Stacey Frank-Heit. Prior to taking over her Jabz Boxing studio, Frank-Heit has experience as an esthetician and spa owner. Her health and wellness experience equips her well for this new role. Known for its full-body circuit style workout that utilizes boxing inspired exercises designed specifically for all women, the studio is located at 8989 E Via Linda, Suite 115, conveniently situated at the busy intersection of Via Linda and 90th Street. Committed to cultivating an empowering fitness community for women, Jabz Boxing offers intense boxing-inspired, full-body workouts to help clients achieve their fitness goals. With 16 women to a class, Jabz classes are kept small to encourage a positive workout experience. All classes are lead by dedicated, certified instructors who offer one-on-one support for all members. Founded in 2012 in Scottsdale by Len Hayko and Kimberlee White, Jabz Boxing took Arizona by storm, quickly becoming the leading boxing-inspired fitness concept in the area due to its high intensity, results driven workouts and strong sense of community. Franchising began in 2013, and Jabz Boxing has already grown to a total of 20 Arizona locations and one location in the Philadelphia metro area. Now, Jabz Boxing plans to increase its footprint across the country, entering key markets, where it will bring women an empowering community and energetic workout experience. For more information on Jabz Boxing visit https://www.jabzboxing.com. To learn more about Jabz Boxing franchise opportunities, visit https://www.jabzboxing.com/own-a-jabz/. PHOENIX – Jabz Boxing announced new ownership for the 16th and Bell location with existing franchisees Marie Miller and Jennifer Nikolou. This will be the second location for Marie and Jennifer. The team’s prior experience in the industry positions them for success as they become multi-unit owners. Marie has a background in sales, marketing, real estate, community development and fitness, while Nikolou brings deep experience in marketing communications, having spent 20 years in the field. Nikolou is currently working as a national account manager at a healthcare information management company. Adding to the high-energy team is Brant Miller with years of experience as a personal trainer and small business owner. Known for its full-body circuit style workout that utilizes boxing inspired exercises designed specifically for all women, the studio is located at 1614 E Bell Rd, Suite 109, conveniently situated at the busy intersection of 16th Street and Bell Road. “Our first Jabz studio has proven to be incredibly rewarding,” said Marie, co-owner of the Jabz 16th and Bell studio. “We’re excited to give people the tools they need to make changes in their lives and empower even more women in the North Phoenix market,” added Brant. “Building a community for women to support each other is what our business is all about – it’s a fantastic feeling to be able to change the lives of our friends and neighbors,” said Nikolou. DENVER – Jabz Boxing, the empowering female-only boxing studio that features full-body, circuit–style workouts using boxing inspired exercises, announced its expansion into Denver. White, along with Jabz Boxing co-founder and president, Len Hayko, opened the first Jabz Boxing studio in 2012 in Scottsdale. The studio quickly reached maximum membership capacity, and they began franchising the concept the following year. Jabz Boxing currently has about 20 franchised studios throughout Arizona and one location in the Philadelphia metro area – all of which are owned by former Jabz Boxing members or employees. Each studio acts as a community center to empower clients to achieve their fitness goals through challenging and fun workouts that allow members to see fast results. Ideal franchisee candidates range from owner-operators with past business experience who are looking to be highly involved in their studios to multi-unit owners looking to develop a number of markets. The overall investment to open a Jabz Boxing franchise location is nearly one-third of the cost of traditional fitness franchise opportunities. In addition to having the full range of perks as an emerging franchise business, including access to leadership and dedicated training at Jabz University, franchisees also receive unparalleled support from the moment they enter the ring, including business planning, pre– and post –opening support, ongoing marketing and employee training. Jabz Boxing studios offer full-body, circuit-style workout utilizing boxing-inspired exercises. Designed specifically for all women, workouts combine cardio, strength training, core work, and plyometrics to help maximize each client’s results and meet fitness goals. Jabz workouts change daily to help keep clients’ bodies constantly challenged and Jabz certified trainers are prepared to help guide and motivate women of all different sizes, ages and body types through an energetic and intimate workout experience. To learn more about Jabz Boxing, visit https://www.jabzboxing.com/. To learn about franchising opportunities with Jabz Boxing, visit https://www.jabzboxing.com/own-a-jabz/. Partnering with Great Brands to Build World Class Franchise Systems, ZGrowth Partners is a consulting firm specializing in managing the franchise sales, operations and brand development of emerging franchise concepts. Through its private equity fund, ZGrowth Capital, its strength is focusing on investing in and growing differentiated franchise concepts with attractive unit-level economics. To learn more about ZGrowth, visit zgrowth.com. Viva Las Vegas! IFA 2019 is just moments away, and several members of the All Points team are eagerly gearing up for the most exciting time of the year in the franchising industry. I am especially excited to return to Las Vegas, surrounded by the contagious energy as we connect with our clients and networking partners. Plus, we’re anticipating making many new connections. It’s always great to see our clients face-to-face, especially at the IFA Convention. We have loyal clients who are our biggest cheerleaders, and it’s important for our team to reflect together with our clients to share new, exciting ways in which we’re helping them reach their core objectives for this year and beyond. I always enjoy hearing the positive feedback from our clients, as well as from the team on their takeaways from the convention. Being a team that places such a high value on professional growth, the convention offers a great opportunity to network and learn from our peers in the industry. 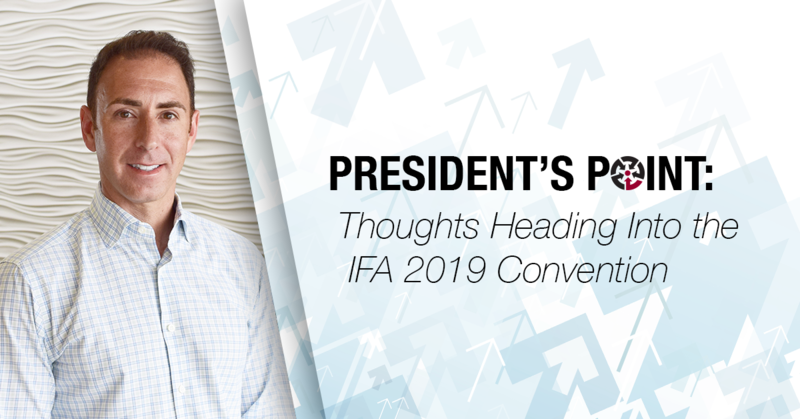 We’ve done great work and have grown tremendously as an agency over the past year, and I look forward to bringing that momentum into this year’s IFA convention. 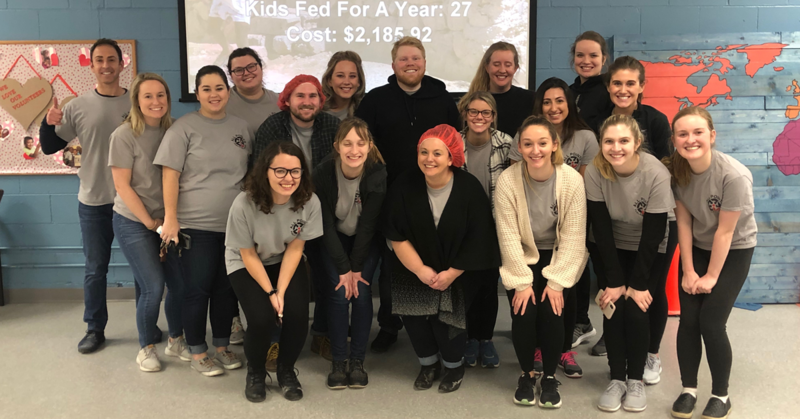 On Thursday, February 14, the All Points PR team volunteered at Feed My Starving Children for our Q1 Positive Impact program. Feed My Starving Children is a non-profit organization that coordinates the packaging and distribution of food to people in developing nations. Before entering the packing room, the All Points team was shown a video of some of the children the organization serves, and how their lives have been changed by receiving regular, nutritious meals. Our team then spent the afternoon working in small groups to pack and seal MannaPack™ meals filled with vitamins, vegetables, soy and rice, keeping in mind the young children and families who would be receiving them. Just one box of food, which equals 216 meals, is enough to feed a starving child for seven months according to the FMSC website. 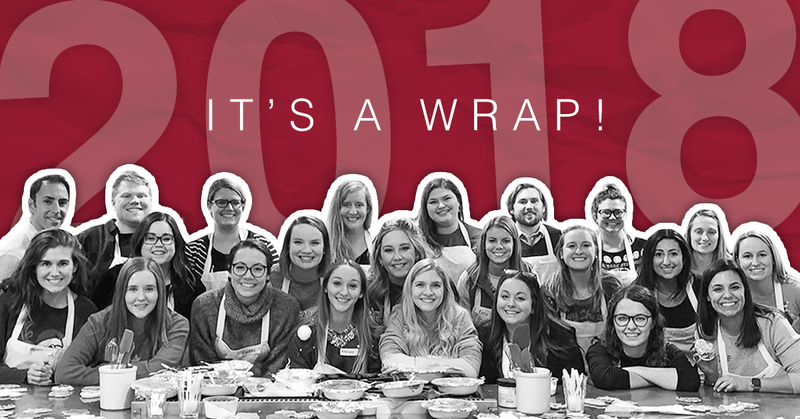 Together, the All Points team worked to pack more than 40 boxes of meals, providing meals for an entire year to over 25 children! The All Points team strives to positively impact communities far and wide through our philanthropic and volunteer efforts with the Positive Impact program. We are passionate about our commitment to corporate social responsibility and making a positive impact on meaningful social, community and environmental organizations. Our team enjoyed a rewarding experience by working together and volunteering our time for those in need. FMSC offered a great teambuilding initiative that encouraged us to help each other pack the meals in an upbeat, spirited environment. We look forward to the next Positive Impact program and the cause we will support. All Points PR coordinated trade coverage with Franchise Times for client Tough Mudder Bootcamp. 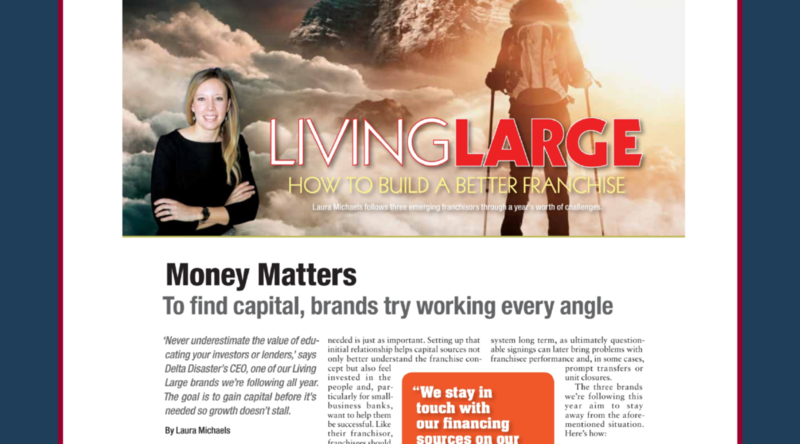 The publication featured Director of Franchise Sales Dan Henry in the “Living Large” column for February, which was centered around securing capital. Coverage ran in print and online. 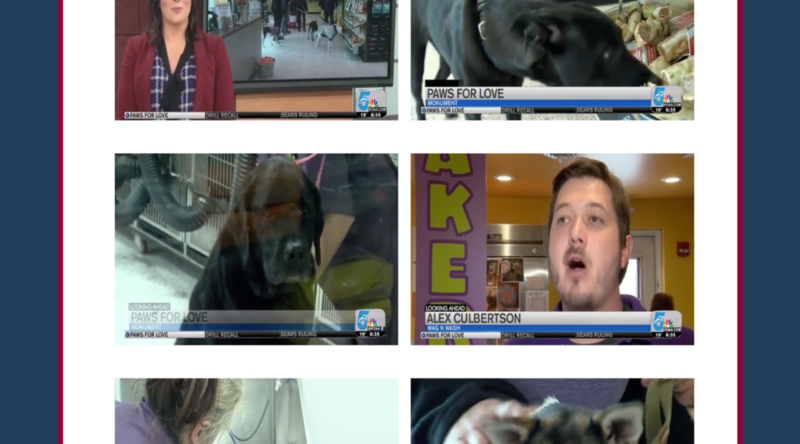 All Points PR landed a TV segment with KOAA for client Wag N’ Wash Natural Food & Bakery. The segment featured a local Wag N’ Wash store, which held an adoption event to help raise money for a volunteer-run animal rescue. Coverage ran on air. All Points PR secured trade coverage with Global Franchise Magazine for client Vitality Bowls. The publication shared an article from the franchise’s Co-founder and COO Tara Gilad, who explained why Generation Z responds to corporate social responsibility. Coverage ran in print and online. All Points PR gained press coverage with the Daily Reporter for client City Wide Maintenance. The article interviewed a City Wide franchisee and highlighted her business in Wisconsin, sharing how she pursued a background in business through her education. Coverage ran online. All Points PR coordinated a TV segment with San Diego’s News 8 Morning Extra on KFMB-TV for client The Camp Transformation Center. In honor of Valentine’s Day, the segment featured how couples can grow stronger through working out together. Coverage ran on air and online. 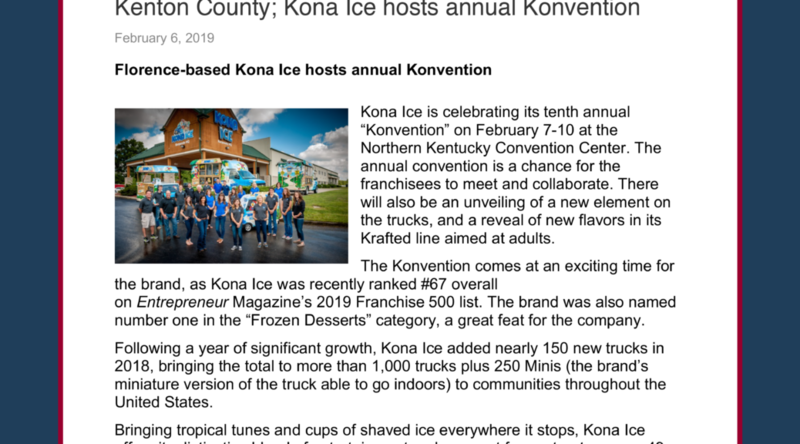 All Points PR secured press coverage with the Northern Kentucky Tribune for client Kona Ice. The article shared word of the franchise’s 10th annual “Konvention,” held February 7-10 at the Northern Kentucky Convention Center. Coverage ran online. All Points PR landed a TV segment with WBFF-TV Fox 45 for client Young Rembrandts. The segment featured local franchise owners, who shared why Young Rembrandts is a top choice for both parents and children, and demoed a drawing lesson. Coverage ran on air. 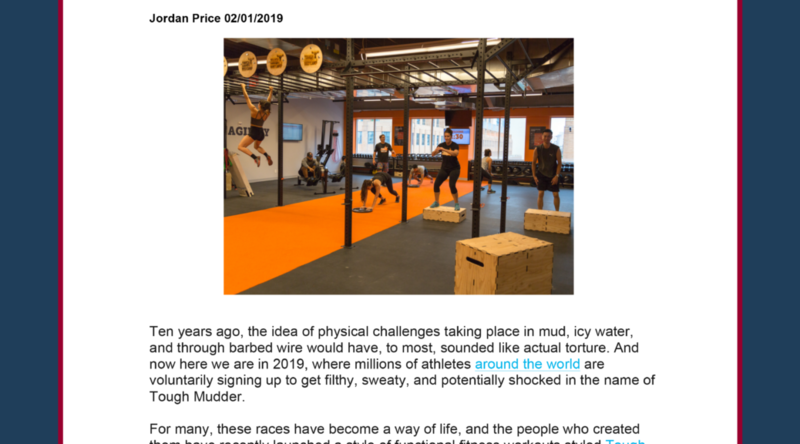 All Points PR secured press coverage with Fitt Denver for client Tough Mudder Bootcamp. The article shared the word of a new gym location slated to open late-March in Denver, as well as details on what the classes entail. Coverage ran online. All Points PR landed a TV segment with Southern New Jersey Today for client Jabz Boxing. The segment, Main Street Minute, profiles local businesses and featured a local Jabz Boxing studio. Coverage ran on air and online. 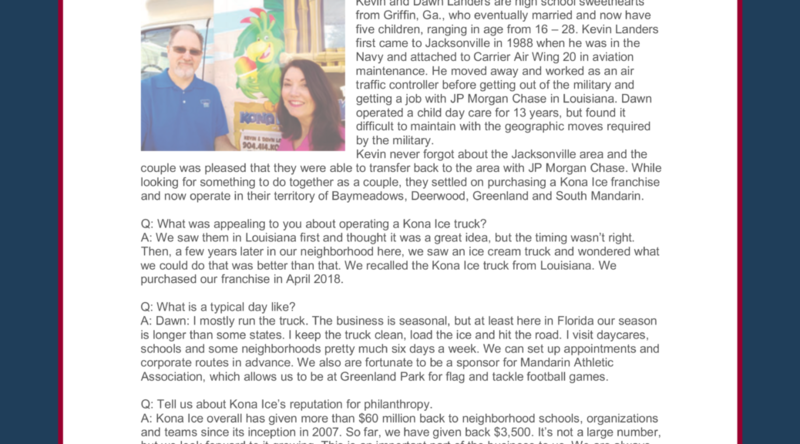 All Points PR gained trade coverage with Franchise Dictionary for client Kona Ice, featuring the franchise’s giveback efforts. The article noted that every year, franchisees raise millions for community organizations across the nation. Coverage ran online. All Points PR coordinated press coverage with the Tyler Morning Telegraph for client Office Pride. 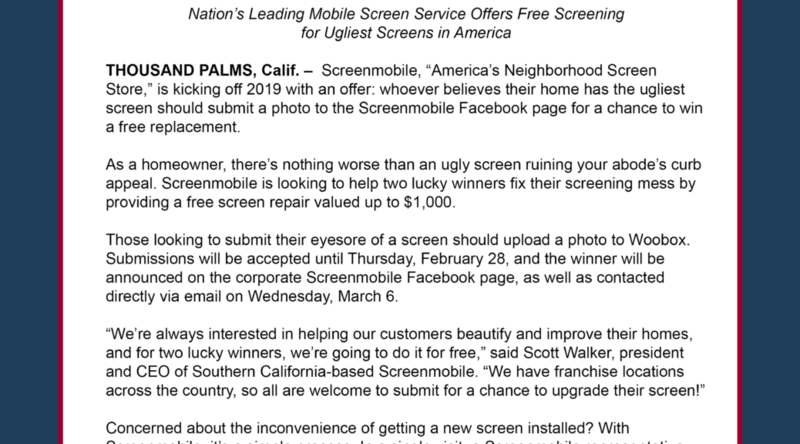 The article discussed the franchise’s recent annual retreat and awards ceremony, highlighting two local owners as the recipients of the “Half-Million Dollar Club” award. Coverage ran online. All Points PR landed press coverage with The Scarborough Mirror for client Cinnaholic. 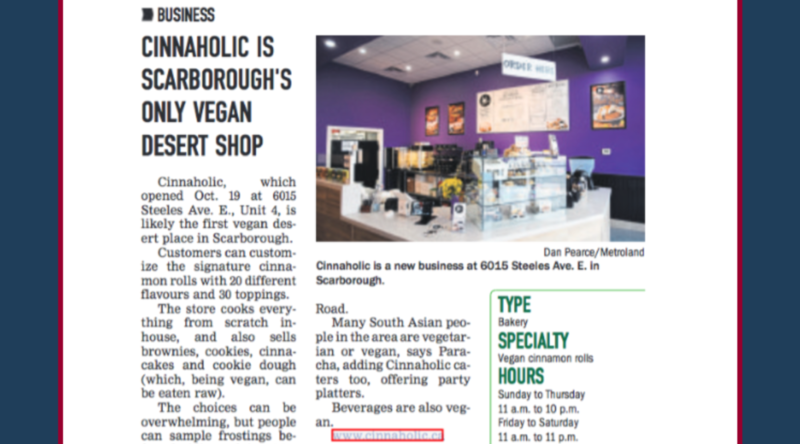 The article highlighted a fall opening of a local Cinnaholic bakery, noting the franchise location as the first vegan dessert place in Scarborough. Coverage ran in print and online. 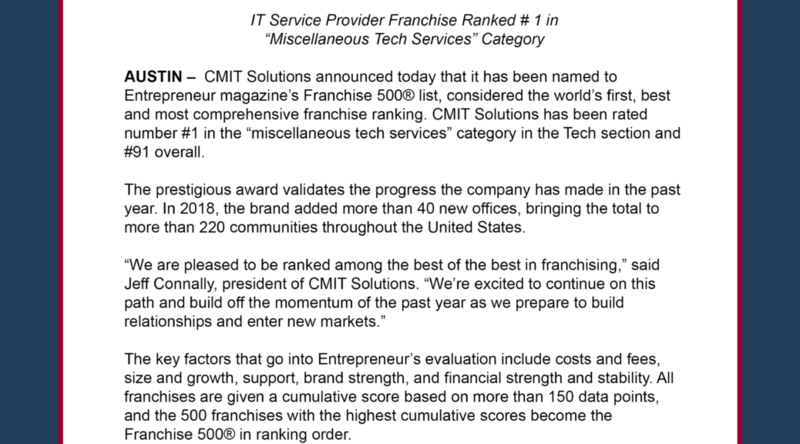 AUSTIN – CMIT Solutions announced today that it has been named to Entrepreneur magazine’s Franchise 500® list, considered the world’s first, best and most comprehensive franchise ranking. CMIT Solutions has been rated number #1 in the “miscellaneous tech services” category in the Tech section and #91 overall. The prestigious award validates the progress the company has made in the past year. In 2018, the brand added more than 40 new offices, bringing the total to more than 220 communities throughout the United States. Entrepreneurially spirited individuals interested in owning a CMIT Solutions franchise should have the ability to invest 128,300, which includes working capital and a typical franchise fee of 49,950. CMIT franchisees are provided with a sizable territory based on ZIP codes and can expect to have 3,000 to 4,000 prime targets. Over its 40 years in existence, the Franchise 500® has become both a dominant competitive measure for franchisors and a primary research tool for potential franchisees. 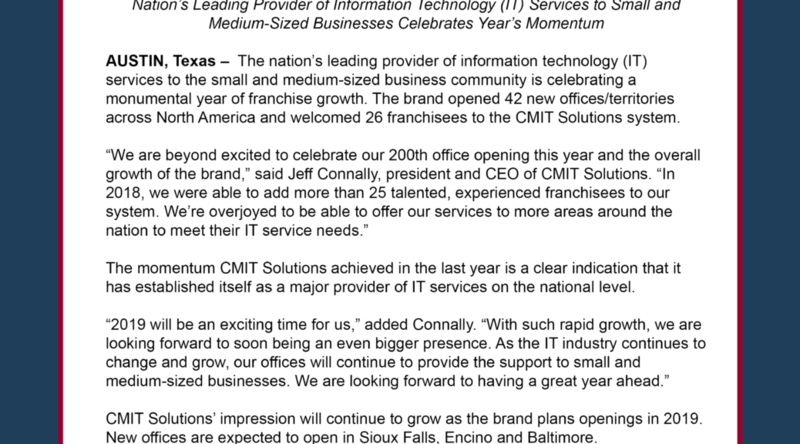 CMIT Solution’s position on the ranking is a testament to its strength as a franchise opportunity. To view CMIT Solutions in the full ranking, visit https://www.entrepreneur.com/franchise500. To learn more about CMIT Solutions, visit: http://www.cmitsolutions.com/. For more information about available franchise opportunities, visit: http://cmitfranchise.com. 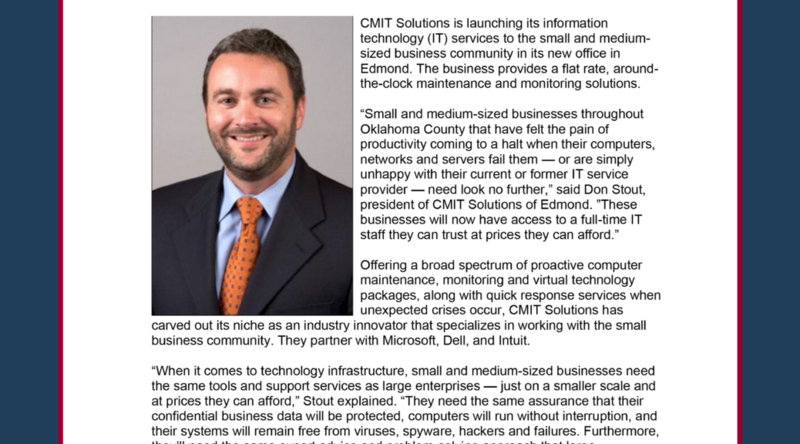 CMIT Solutions (CMIT) is a leading provider of information technology (IT) professional services and products to small and medium-sized businesses, and is uniquely capable of supporting small businesses anywhere, coast to coast in the United States and Canada. By focusing on developing and maintaining local, trust-based relationships with its customers, CMIT is able to meet all of their IT needs. CMIT offers a wide variety of services and products, including enterprise-class solutions, at prices small businesses can afford. CMIT Solutions has been ranked number one in its category in Entrepreneur magazine’s Franchise 500® list for seven consecutive years. Because of its growing geographic presence and partner programs, CMIT is a very attractive sales and/or support channel for larger firms desiring to reach the millions of small and medium-sized businesses in the United States. For 40 years, Entrepreneur Media Inc. has been serving the entrepreneurial community providing comprehensive coverage of business and personal success through original content and events. Entrepreneur magazine, Entrepreneur.com, and publishing imprint Entrepreneur Press provide solutions, information, inspiration and education read by millions of entrepreneurs and small business owners worldwide. 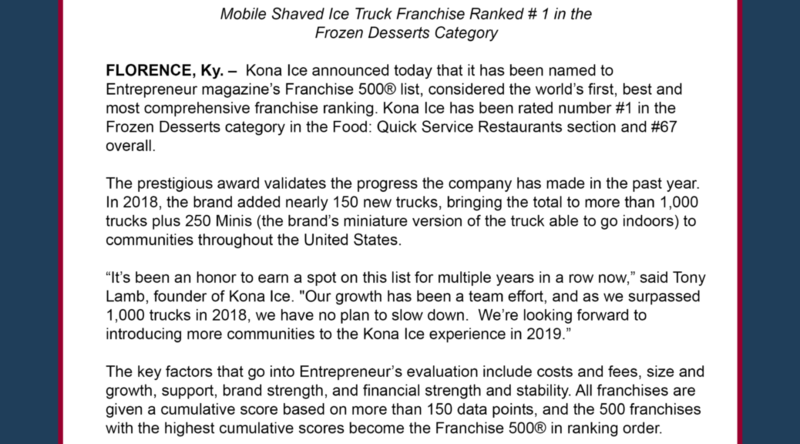 FLORENCE, Ky. – Kona Ice announced today that it has been named to Entrepreneur magazine’s Franchise 500® list, considered the world’s first, best and most comprehensive franchise ranking. Kona Ice has been rated number #1 in the Frozen Desserts category in the Food: Quick Service Restaurants section and #67 overall. The prestigious award validates the progress the company has made in the past year. In 2018, the brand added nearly 150 new trucks, bringing the total to more than 1,000 trucks plus 250 Minis (the brand’s miniature version of the truck able to go indoors) to communities throughout the United States. Bringing tropical tunes and cups of shaved ice everywhere it stops, Kona Ice offers its distinctive blend of entertainment and gourmet frozen treats across 47 states. Equally as appealing as the icy treats that the brand offers is its philanthropic commitment in the communities it serves. Nationwide, Kona Ice has donated more than $60 million to community-based organizations since the launch in June 2007. Providing entrepreneurs interested in investing in the franchise a full suite of support services ranging from initial and ongoing training to sales and marketing programs, the Kona Ice investment ranges in price from $117,125 – $135,925. An initial franchisee fee of $20,000 is required, and finance programs are in place to support qualified entrepreneurs in their Kona Ice investment. Over its 40 years in existence, the Franchise 500® has become both a dominant competitive measure for franchisors and a primary research tool for potential franchisees. Kona Ice’s position on the ranking is a testament to its strength as a franchise opportunity. To view Kona Ice in the full ranking, visit https://www.entrepreneur.com/franchise500. For more information about available franchise opportunities, visit: www.ownakona.com. 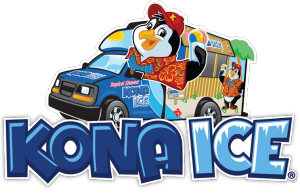 A true community ally renowned for facilitating endless fundraising options, Kona Ice has given $60 million back to neighborhood schools, organizations and teams since its inception in 2007. 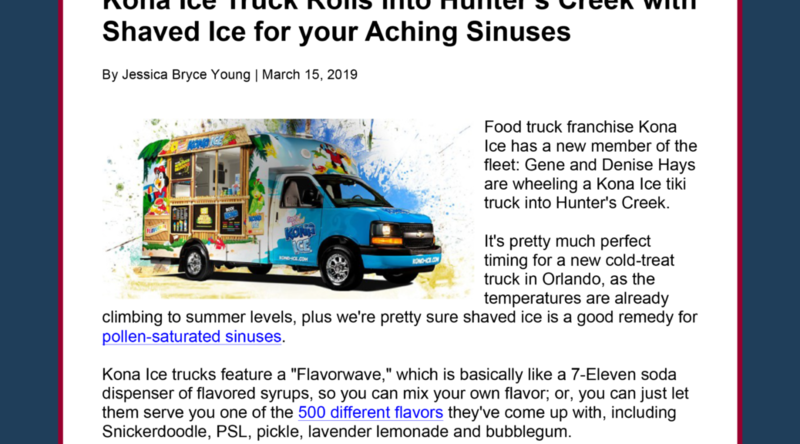 The brand’s iconic truck offers customers a one-of-a-kind experience, featuring the opportunity to create their own shaved ice on the self-serve Flavorwave™, while enjoying the soothing sights and sounds from the tropics. Currently, there are 1,000-plus franchise units in more than 47 states. For many, the new year offers a fresh start. It’s a great time to reflect on the past year to evaluate the goals set and aspire to achieve new ones. When asked about their New Year’s resolutions, the All Points team had many great workplace goals to share. 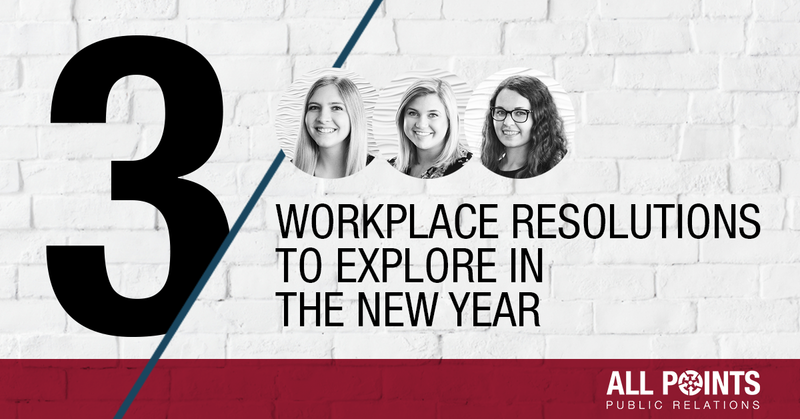 Here are several workplace resolutions that are worth exploring in the new year and why our team feels they’re important. The world of public relations offers plenty of opportunities to step into a leadership role. Whether it’s tackling a new project, leading a presentation or initiating an integrated campaign, new and established PR professionals can always find more ways to strengthen their skillset. Emily M., one of our Public Relations Associates, has just that in mind looking into 2019. Technology plays a powerful role in today’s PR climate. Email platforms, design programs and other management systems are essential to running successful campaigns, generating leads and building brand awareness. Barbara, one of our team’s Digital and Creative Associates, understands that there is always the opportunity to learn more and seek efficiency with the programs she uses, no matter her experience. At All Points, our team is always looking for more ways to exceed our clients’ expectations. Meredith, one of our Content Marketing Associates, recognizes that there is always room to grow when it comes to going above and beyond expectations. 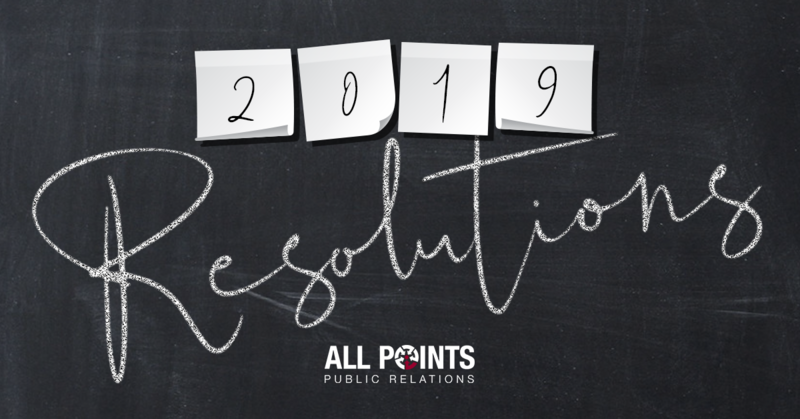 The All Points team looks forward to 2019 and all the opportunities for personal and professional growth to come. AUSTIN, Texas – The nation’s leading provider of information technology (IT) services to the small and medium-sized business community is celebrating a monumental year of franchise growth. The brand opened 42 new offices/territories across North America and welcomed 26 franchisees to the CMIT Solutions system. The momentum CMIT Solutions achieved in the last year is a clear indication that it has established itself as a major provider of IT services on the national level. CMIT Solutions’ impression will continue to grow as the brand plans openings in 2019. New offices are expected to open in Sioux Falls, Encino and Baltimore. PLYMOUTH, Mich. – Allegra Marketing Print Mail, a franchise concept that serves the multi-billion dollar market for marketing, print and graphics services, is poised to expand its footprint in North America. According to Anne Nemer, vice president of Franchise Development, the growth plan includes British Columbia and Ontario, Canada; Palm Beach and Dade Counties in Florida; Sacramento and Los Angeles Counties, California; Jefferson, Kentucky and Maricopa Counties, Arizona; and King County, Washington, as parent company Alliance Franchise Brands LLC offers two flagship programs to independent printers and entrepreneurs looking for a proven model. The Allegra Advantage℠ Program is an attractive solution for independent marketing and print services business owners who want to grow the value of their company by gaining access to a host of franchise network resources. “The program enables business owners to diversify services to drive sales and earnings, build greater equity and operate more efficiently,” said Nemer. When the mid- or long-range plan is to sell, the association with the franchise creates a roadmap to a more profitable exit and can identify qualified buyers when the time is right. To learn more about the Allegra Marketing Print Mail brand and its breadth of services, visit http://allegramarketingprint.com. For more information about franchise opportunities, visit http://allegrafranchise.com. Alliance Franchise Brands LLC, a world leader in marketing and visual communications, has grown to become a holding company for nine franchise concepts, linking more than 650 locations in North America. Independently-owned and operated franchises provide national, regional and local businesses and organizations with a one-stop resource for technologically advanced and strategically sound solutions for their graphics communications needs under the Allegra Marketing Print Mail, American Speedy Printing, Image360, Insty-Prints, KKP, Signs By Tomorrow, Signs Now and Zippy Print brands. RSVP Publications is one of the largest direct mail advertising companies in the U.S. Franchise locations deliver on the proven concept of “Direct Mail to the Upscale” through luxury card packages. Visit https://alliancefranchisebrands.com/ to learn more. All Points PR coordinated press coverage with Your Hub – Denver Post for client Kona Ice. The publication shared news of South Central Denver franchisees and their giveback efforts, citing that the franchise itself has donated more than $60 million nationwide to community-based organizations since its launch in 2007. Coverage ran online. 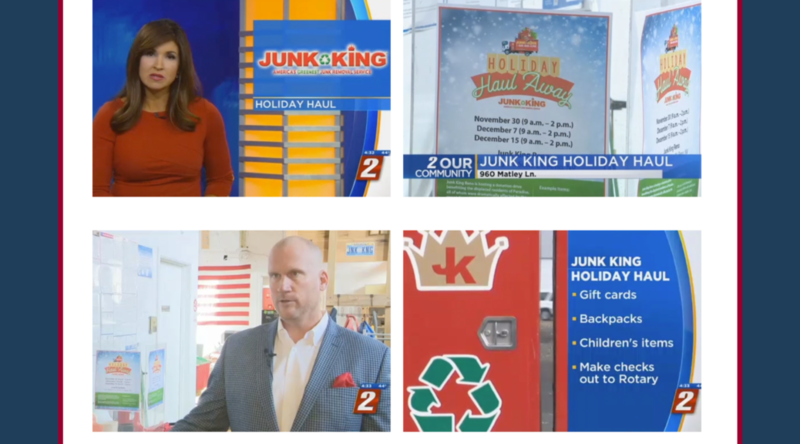 All Points PR gained a TV segment with KTVN for client Junk King. The segment shared a local franchise’s “Holiday Haul” event, which gathered gift cards, backpacks, children’s items and donations ahead of the holiday season to give to families affected by the wildfires in California. Coverage ran on air and online. 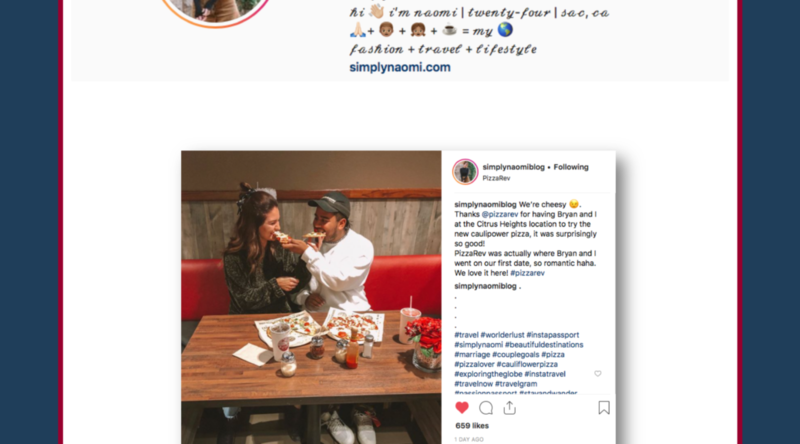 All Points PR secured an Instagram placement with fashion, travel and lifestyle blogger @simplynaomiblog for client PizzaRev. The blogger shared a picture of herself and her significant other trying the franchise’s new CAULIPOWER pizza at the Citrus Heights location. 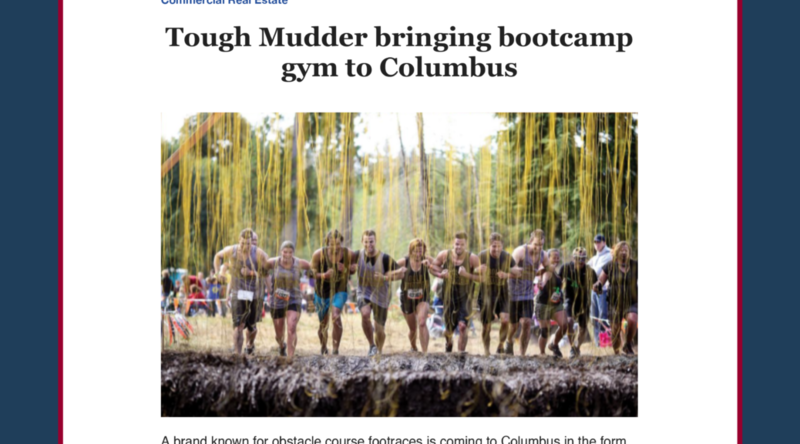 All Points PR landed press coverage with Columbus Business First for client Tough Mudder Bootcamp. The article shared the word of the fitness franchise’s new gym opening in Columbus, Ohio, highlighting the type of workout participants will experience at the gym. Coverage ran online. The All Points team has big plans for heading into the new year. From traveling and volunteering to living healthier and continuing education, our team is looking forward to a fresh year filled with more opportunities to achieve our goals. Check out our 2019 New Year’s resolutions! Maddy: …to get better about finding HAROs for my clients and to find more ways to be active after work. Megan: …to cook more! I want to spend time each week trying new recipes and figuring out my go-tos for lunch-prep, party hosting and everything in-between. Emily M: …to adapt a healthier lifestyle and keep a positive mentality through 2019! Barbara: …to pursue continued education. There’s so much more to learn about the programs I use on a daily basis, and my goal is to stay on top of any new updates and changes. Sydney: …to continue my 2018 resolution of reading one book every month, and to seek out new professional learning opportunities for myself, my teams and the office. Lauren: …to learn something new. Give back. Read more. Katie: …to cook more often, finish decorating my apartment and appreciate the little things in life more! Stephanie: …to focus my attention on becoming the best new mom that I can be and ensuring that all is prepared ahead of my son’s arrival in May. Emily B: …to stay on track with my fitness goals and get back to working out regularly like I used to. Amanda: …to give myself and my plants more water, develop a consistent and healthy workout and weight routine, actually use my gym membership, read at least one book every month and dedicate more time to friends, family and my own self care. Allie: …to clean my inbox in some way each day and to drink more water. Mackenzie: …to make more time for volunteering in the community and to use my PTO time more wisely throughout the year rather than just saving the majority of it for the end of the year. I’m also hoping to start my Master’s degree before the end of the year! Spencer: …to learn how to play the banjo. To accomplish this I plan to dedicate a minimum of three hours per week fumbling the strings until I can finally pluck a tune. Jessica: …to make more memories through travel and new experiences. Meredith: …to continue to exceed clients’ expectations and keep my apartment clean! Alex: …to cut back on my daily screen time and read instead. Gillian: …to learn how to garden and start growing fruits and vegetables indoors. Jenna: …to implement healthy habits into my life in and outside of work like drinking more water, eating healthier and exercising more. Annie: …to spend less money on Starbucks and Dunkin’ and to transition to a morning workout person. Jamie: …to recalibrate my advisor role versus my tactical role. I will be more assertive with myself as it comes to strategy, leadership and coaching. Joey: …to establish a morning routine that sets me up for a successful day. I want to get up earlier, enjoy a cup of coffee and consume the news before heading into work. More me-time in the morning will help me feel fully charged! Bailey: …to spend more time volunteering with local youth organizations. Gautier: …to get seven hours of sleep a night. It’s the key to consistent productivity and keeping your mind agile! 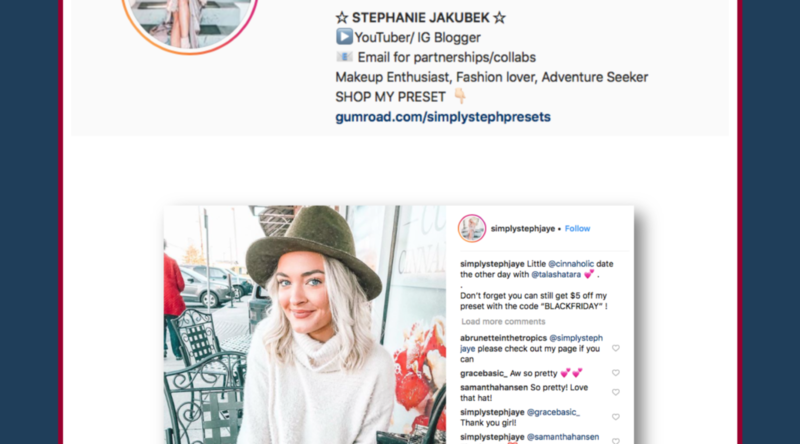 All Points PR gained an Instagram placement with YouTuber and Instagram blogger @simplystephjaye for client Cinnaholic. The blogger shared a photo of herself dining outdoors at a local Cinnaholic location. All Points PR secured a local TV segment with WCPO-TV for client Young Rembrandts. 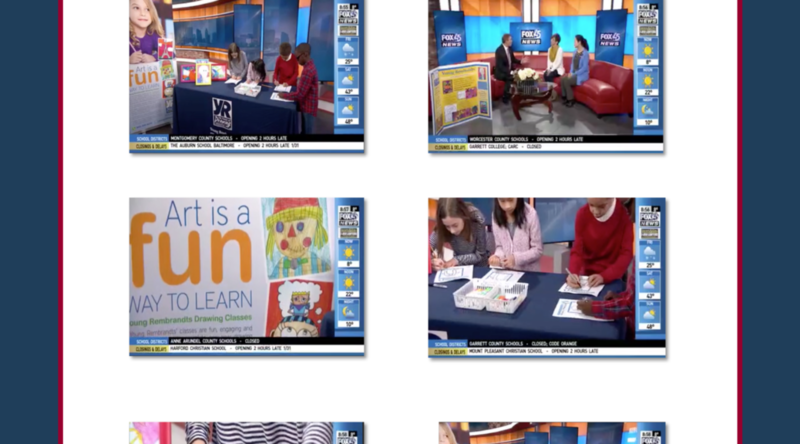 The segment featured a DIY turkey drawing session demonstrating how children develop their skills with Young Rembrandts. Coverage ran on air. All Points PR landed a Facebook placement with The Daily Independent for client Pizza Factory. 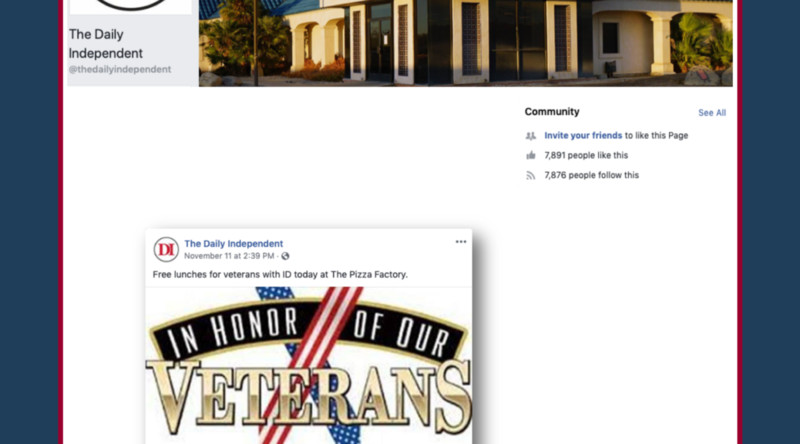 The post featured deals and events happening locally for Veterans Day, and shared information on Pizza Factory’s offer of a free lunch for veterans with ID. 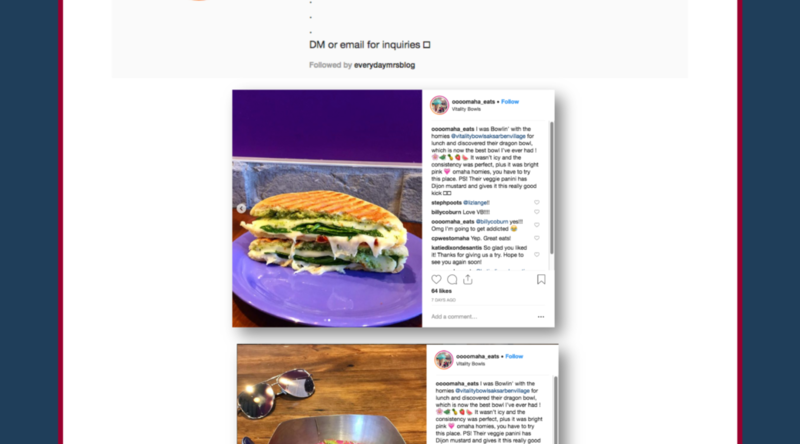 All Points PR coordinated an Instagram placement with @eatwithzinsd for client PizzaRev. 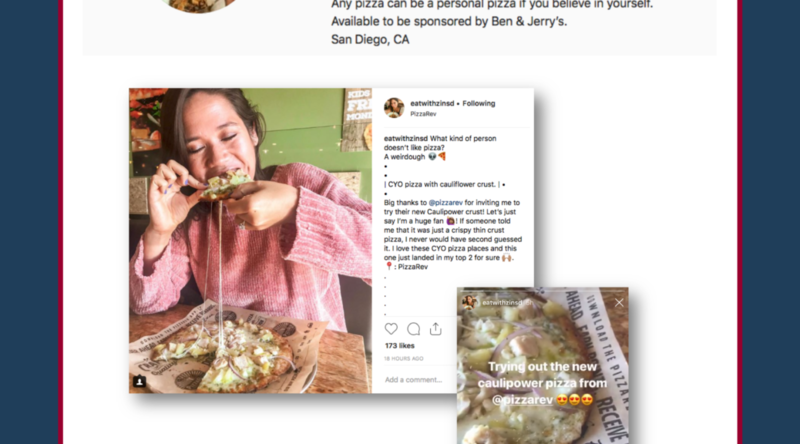 The food blogger shared a photo and a post on her Instagram story of her visit to the San Diego PizzaRev, where she tried the CAULIPOWER pizza crust. All Points PR landed trade coverage with Franchise Update for client Young Rembrandts. 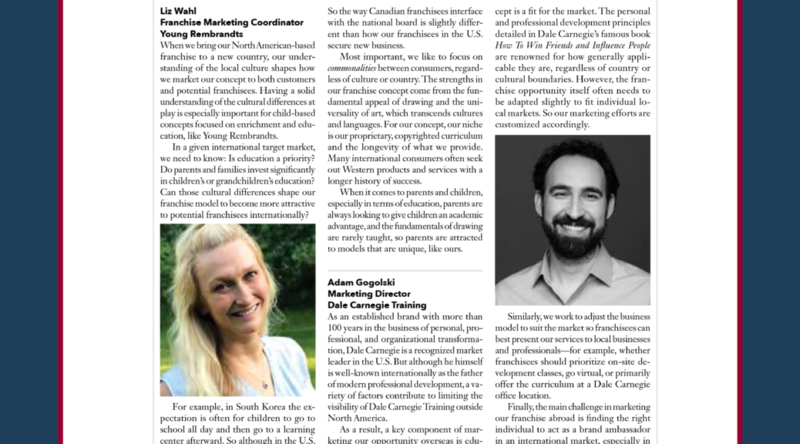 A CMO roundtable article featured Liz Wahl, the franchise marketing coordinator with Young Rembrandts, who discussed the marketing challenges associated with taking a brand across borders. Coverage ran in print and online. 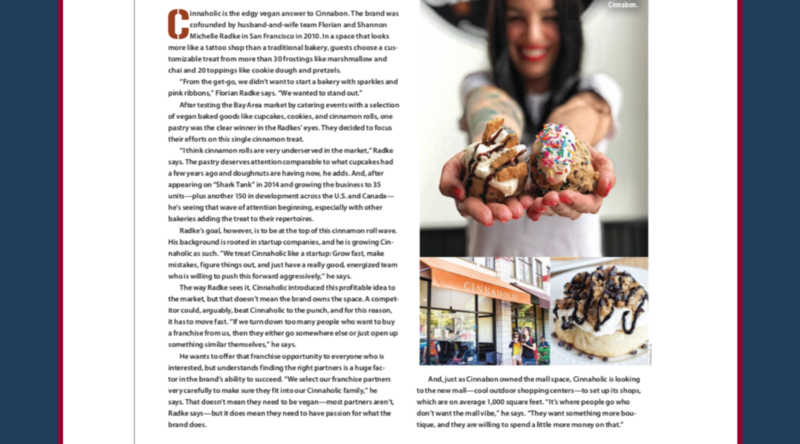 All Points PR secured press coverage with Food Network Canada for client Cinnaholic. 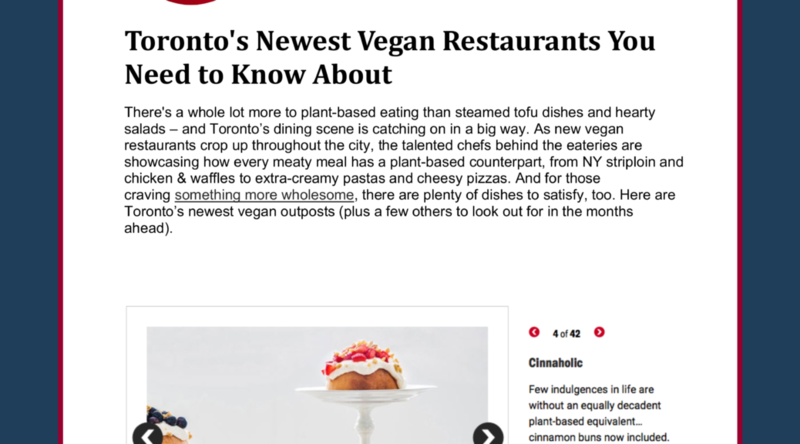 The article profiled Toronto’s newest vegan restaurants and featured the newest Cinnaholic location in the area. Coverage ran online. The All Points PR team recently celebrated the holiday season during our 2018 holiday party. There, the team enjoyed dinner, desert and a gift exchange, complete with the inaugural “APPRs” and a team seminar. President Jamie Izaks kicked off the night with our Q4 contest, The 2018 APPRs. In the weeks leading up to the first-ever awards event, the team filled out ballots nominating team members and pods for their hard work in the following categories: Media Relations, Social Media & Graphics, Content Marketing, Client Management & Professionalism, and Integration. Winners included Senior Account Lead Gillian Losh for Top Notable Placement, Director Sydney Thompson for Strongest Byline and Creative and Digital Associate Barbara Krygowska for Best Integrated Campaign of the Year. In the seminar, COO and Executive Vice President Lauren Izaks shared a reflective overview of the agency’s growth, as well as what’s to come in the new year with the collaboration of several team members. Lauren began the presentation with a timeline of the agency’s growth – from its founding in August 2011 to a new and improved office location, the introduction of team seminars, the Positive Impact program and much more. The team was then treated to a photo collage video highlighting 2018 as a whole, from conferences and holiday celebrations to team outings and general fun around the office. Lauren then invited several team members to discuss new developments and systems moving into 2019. Lead Project Manager Megan French was the first to take the stage to review important scheduling information across the agency. Director Bailey Hewitt then went over 2019 dates for our monthly seminars, encouraging team members to seek out new learning opportunities to share. On the creative side, Senior Creative & Digital Account Lead Allie Kramer and Creative & Digital Associate Barbara Krygowska shared exciting materials coming into play beginning in January. 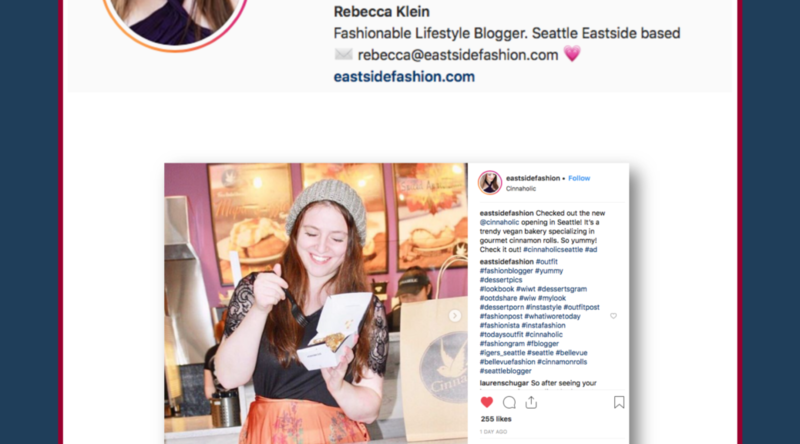 One reveal featured a client-focused newsletter, showcasing the diverse insights and services of All Points in digital marketing and social media, content marketing and public relations. Lauren wrapped up the presentation with a few words of inspiration and an exciting announcement on an initiative designed to bring our team even closer to our clients. The team enjoyed reflecting on 2018 as a whole, taking a look at past years with the agency and anticipating all that’s yet to come. The holiday season and celebratory atmosphere of the night certainly set the stage for ringing in an exciting new year at All Points. 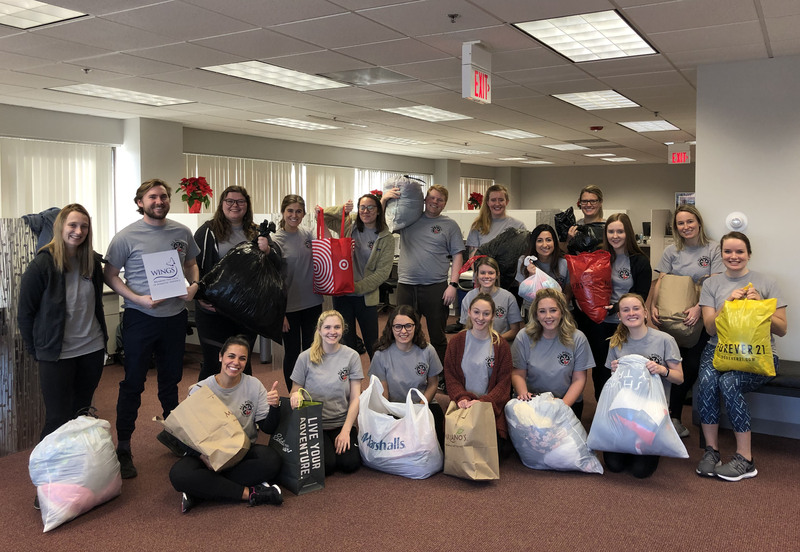 On Thursday, December 6, the All Points PR team participated in a clothing & accessory drive and self-defense class for our Q4 Positive Impact program. To partner with WINGS, an organization committed to helping adults and children escape domestic violence and abuse, the All Points team collected bags full of men’s, women’s and children’s clothing, shoes and other accessories for donation. These items were given to WINGS Resale shops, as proceeds from these shops account for 25% of the program’s budget. The team then participated in a self-defense class at the Alpha Krav Maga Compound in Northbrook. The national training center delivered a two-hour class packed with demonstrations, partnered drills and a Q&A session offering essential tips for defense in a variety of violent situations. At the end of our session, the instructors offered a generous gift of a week of free self-defense classes for each team member and a guest. The All Points team strives to positively impact the communities in which we live and work through our philanthropic and volunteer efforts through our Positive Impact program. We are passionate about our commitment to corporate social responsibility and making a positive impact on meaningful social, community and environmental organizations. The team enjoyed a rewarding experience by giving to those in need, while gaining perspective on escaping violence through the self-defense class. We look forward to the next Positive Impact program and the cause we will support. 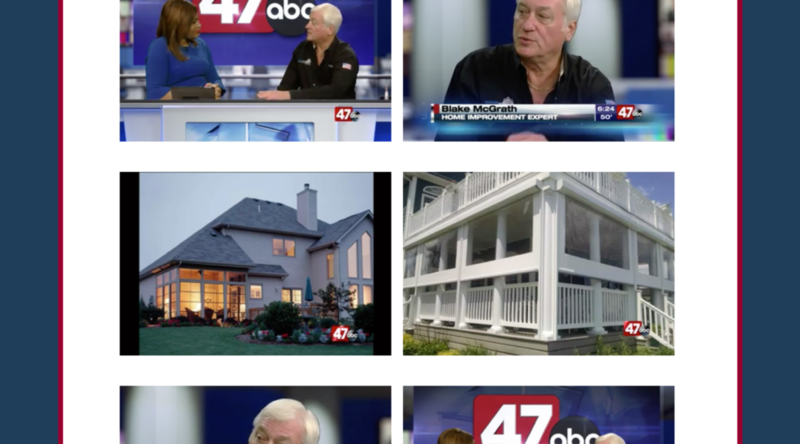 All Points PR secured a local TV segment with ABC 47, WMDT-TV for client Screenmobile. 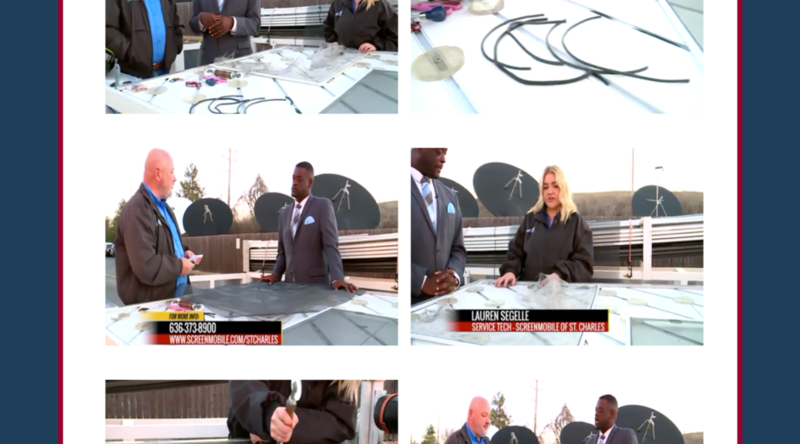 The segment featured a franchisee from Screenmobile of Delmarva, who talked about how homeowners can protect their homes from winter weather conditions and enjoy their screened-in porches/multi-season rooms year-round. Coverage ran on air and online. 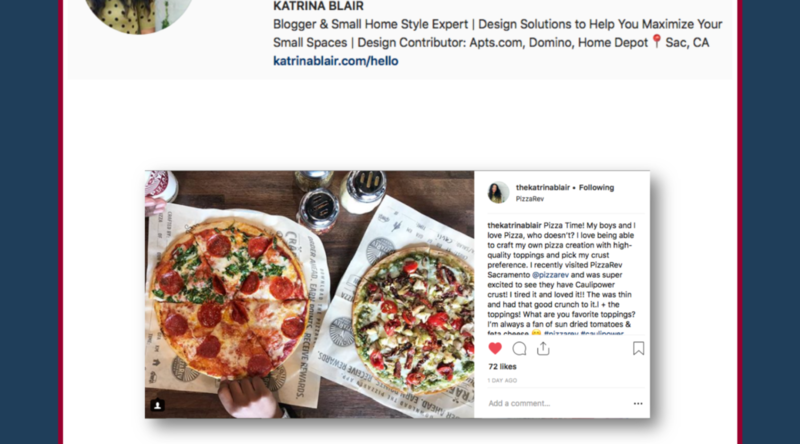 All Points PR gained an Instagram placement with blogger @thekatrinablair for client PizzaRev. The blogger featured a photo of her lunch with her family at PizzaRev Sacramento, sharing word on their CAULIPOWER pizza crust offering. All Points PR coordinated press coverage with the Rockford Register Star for client Pearle Vision. The article announced the franchise’s expansion plan in northern Illinois, set to open 5 EyeCare centers in the area over the next three years. Coverage ran online and in print. 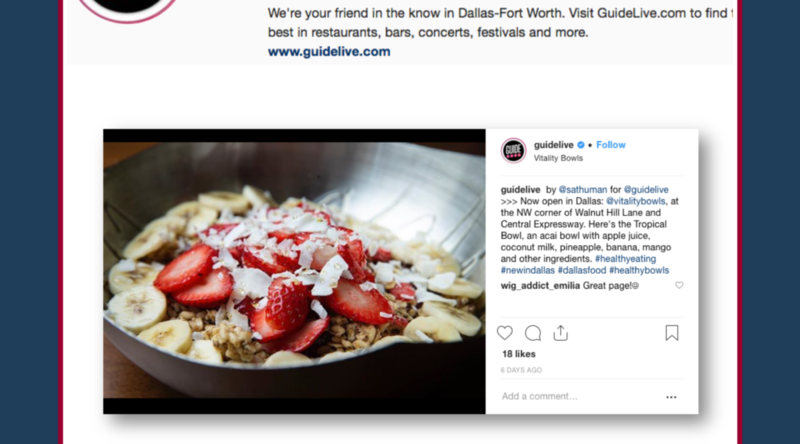 All Points PR landed an Instagram placement with food influencer @Oooomaha_eats for client Vitality Bowls. The influencer shared several photos of menu items she enjoyed at a local Vitaly Bowls, including their dragon bowl and veggie panini, and recommended them to her local Omaha followers. 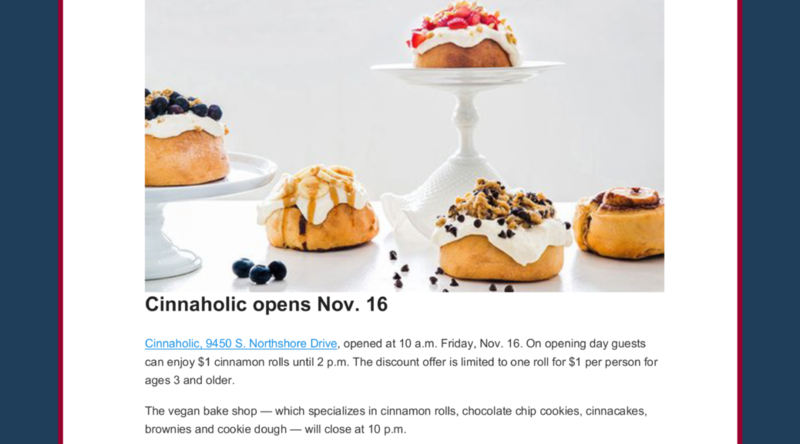 All Points PR secured press coverage with the Knoxville News Sentinel for client Cinnaholic. The article shared the word of a new local franchise location, offering $1 cinnamon roles to guests on opening day. Coverage ran online. 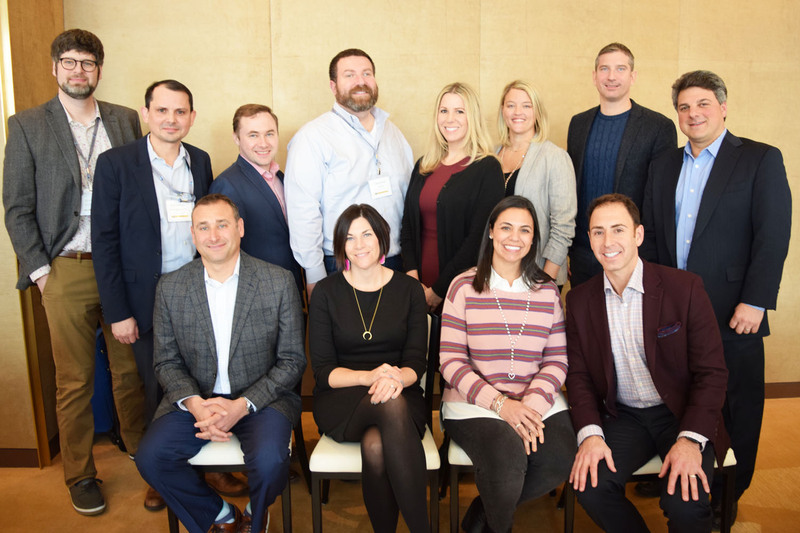 The Northern Illinois Franchise Association (NIFA), co-founded by Jamie and Lauren Izaks and Andrew Bleiman, recently hosted its 2018 November Luncheon at Somerset in the beautiful Viceroy Chicago. The Luncheon allows NIFA to continue its work educating the Chicagoland community about the most pressing franchise-related topics of the day. Key issues and trends related to restaurants, franchising and third parties stood as a major focus among panelists, including the need for technology, innovation and ensuring an effective customer experience. Upcoming 2019 trends, such as the role of technology, loyalty programs and the sustainability in delivery, were also thoroughly evaluated. Guests enjoyed the unique perspectives shaped by the panelists’ expertise and roles in the on-demand economy. In addition to the panel and the delicious meal, attendees enjoyed free valet parking sponsored by All Points PR and Marks & Klein, as well as lively networking sessions before and after the panel. The event was sponsored by Bank of America. Stay tuned for details on the upcoming November 2018 NIFA luncheon, and visit www.northernilfranchise.org for more information about the organization. All Points PR gained press coverage with Chicago Food Magazine for client America’s Dog & Burger. 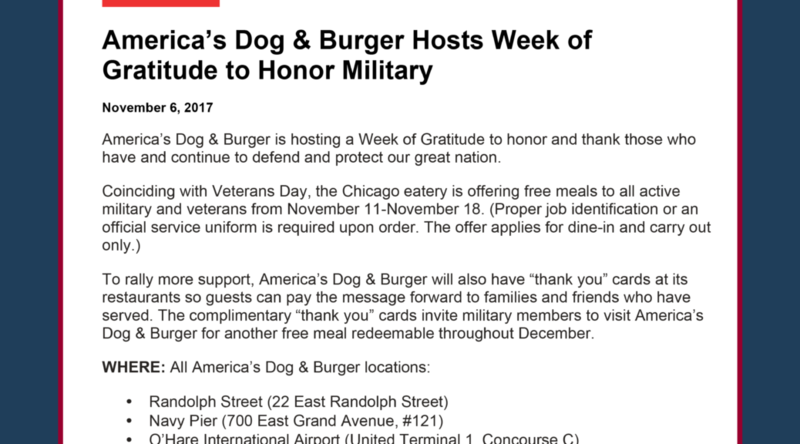 The article highlighted the brand’s upcoming Veteran’s Day deal as a part of their Week of Gratitude, which included “thank you” cards so guests could pay the message forward to friends and family who have served. Coverage ran online. 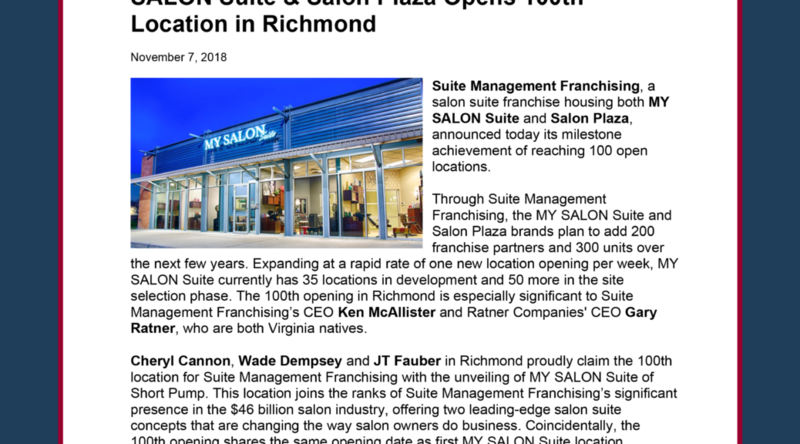 All Points PR coordinated trade coverage with Salon Today for client Suite Management Franchising, the parent of MY SALON Suite and Salon Plaza. The article shared the announcement of the brand’s 100 open locations milestone. Coverage ran online. It’s that time of year again – the leaves are falling, the temperature outside is dropping and the All Points team is taking a moment to reflect on what we’re thankful for. Whether personal or professional, our team has plenty of things to give thanks for. Check out what our team is thankful for this holiday season! Emily M: I am thankful for my friends, family and incredibly supportive fiancé who all keep me motivated and driven. I am also thankful for all of my pets in my mini zoo of a home: my puppy, two bearded dragons, two frogs and a fish. Also, I am thankful for ranch dressing. I don’t know what I would do without ranch dressing. Sydney: I am thankful for the support of family, true friends, amazing colleagues and the restorative power of puppy cuddles. Jamie: I am thankful to be a part of a close-knit family that is equally as loving and caring as they are filled with fun and laughter. Jessica: I am thankful for my supportive family and the memories we’ve had the opportunity to create this year. Stephanie: I am thankful for my husband, health, job, supportive family and the blessings that I have received this past year. Maddy: I’m thankful for my little sisters. They are a ton of fun and without them my life would be a lot more boring and much quieter. Lauren: I am thankful for family, friends and community. I am also thankful for the journey. Emily B: I am thankful that more companies are making strides to go green and create products that do less harm to the environment. I care deeply about my environmental impact and it’s great to see more corporations are starting to do the same. Amanda: I am thankful for my loved ones, education, career and good health. Katie: I am thankful for my friends and family for being such a great support system and also for such awesome colleagues who I continue to learn from every day! Megan: I am thankful for all the professional growth I’ve experienced since coming on board at All Points ten months ago! Allie: I am thankful for my family and loved ones, my APPR family for inspiring me and challenging me to be more creative and for Jamie and Lauren for making APPR such a great place to work. Barbara: I am thankful for all the support and love from friends, family and my team here at All Points as I celebrated my marriage! It was an exciting year overall and I can’t wait to see what lies ahead. Mackenzie: I am thankful for family, friends, the opportunity to work with awesome people and for dogs! Meredith: I am thankful for my supportive family and friends, co-workers that help make work fun and of course, mac & cheese. Spencer: I am thankful for the tortilla chip. Tortilla chips are there for you through good times and bad. They’re my go-to snack and they pair well with a variety of dips. They’re also a great side for your Thanksgiving meal! Gautier: I am thankful for my roommate — it’s great to come home to a positive attitude, and sometimes a glass of wine, every night! Joey: I am thankful for my loving family, close-knit friendships and an office full of collaborative go-getters! Jenna: I am thankful for every opportunity I’ve been given and the endless support of my family and friends. Gillian: I am very thankful for my loving, supportive family, my health and my MVP best friend/roommate/cat Franklin. Annie: I am thankful for receiving a great education, starting a fulfilling career at All Points and being surrounded by my family and friends. Bailey: I am thankful to have friends and family that support me in whatever it is I want to do. 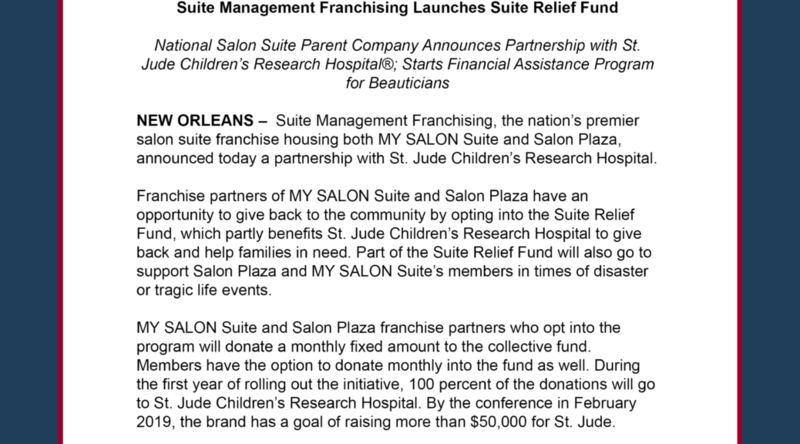 NEW ORLEANS – Suite Management Franchising, the nation’s premier salon suite franchise housing both MY SALON Suite and Salon Plaza, announced today a partnership with St. Jude Children’s Research Hospital. Franchise partners of MY SALON Suite and Salon Plaza have an opportunity to give back to the community by opting into the Suite Relief Fund, which partly benefits St. Jude Children’s Research Hospital to give back and help families in need. Part of the Suite Relief Fund will also go to support Salon Plaza and MY SALON Suite’s members in times of disaster or tragic life events. MY SALON Suite and Salon Plaza franchise partners who opt into the program will donate a monthly fixed amount to the collective fund. Members have the option to donate monthly into the fund as well. During the first year of rolling out the initiative, 100 percent of the donations will go to St. Jude Children’s Research Hospital. By the conference in February 2019, the brand has a goal of raising more than $50,000 for St. Jude. St. Jude Children’s Research Hospital is leading the way the world understands, treats and defeats childhood cancer and other life-threatening diseases. It is the only National Cancer Institute-designated Comprehensive Cancer Center devoted solely to children. Treatments invented at St. Jude have helped push the overall childhood cancer survival rate from 20 percent to more than 80 percent since the hospital opened more than 50 years ago. St. Jude freely shares the discoveries it makes, and every child saved at St. Jude means doctors and scientists worldwide can use that knowledge to save thousands more children. Families never receive a bill from St. Jude for treatment, travel, housing or food – because all a family should worry about is helping their child live. For more information about the Suite Relief Fund, visit http://www.mysalonsuite.com/the-suite-relief.html. To learn more about MY SALON Suite and Salon Plaza, visit www.mysalonsuite.com and www.salonplaza.com. To learn more about St. Jude Children’s Research Hospital, visit https://www.stjude.org. LEXINGTON, Tenn. – Huddle Up, Western Tennessee: Huddle House is coming your way! 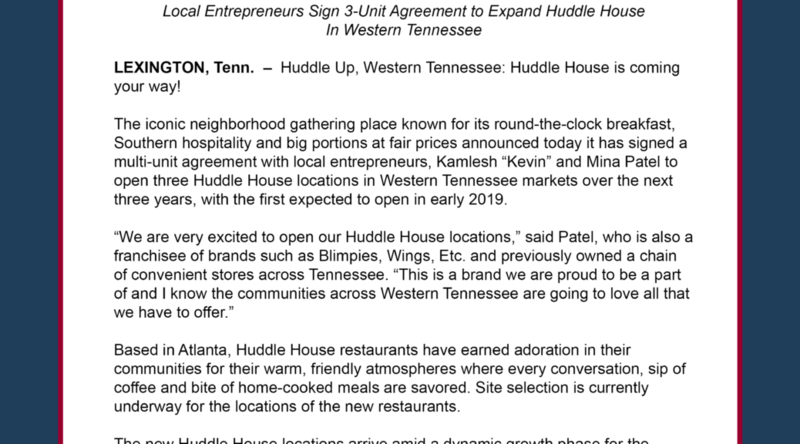 The iconic neighborhood gathering place known for its round-the-clock breakfast, Southern hospitality and big portions at fair prices announced today it has signed a multi-unit agreement with local entrepreneurs, Kamlesh “Kevin” and Mina Patel to open three Huddle House locations in Western Tennessee markets over the next three years, with the first expected to open in early 2019. Based in Atlanta, Huddle House restaurants have earned adoration in their communities for their warm, friendly atmospheres where every conversation, sip of coffee and bite of home-cooked meals are savored. Site selection is currently underway for the locations of the new restaurants. 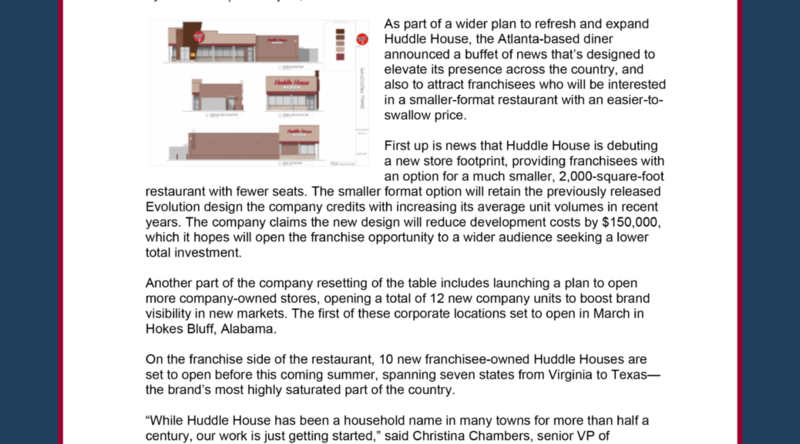 The new Huddle House locations arrive amid a dynamic growth phase for the brand. In addition to the new locations, Huddle House has several additional openings planned for 2019 including Petersburg, Virginia, Kershaw, South Carolina and Paragould, Arkansas. Huddle House’s commitment to serving freshly prepared home-style food in a friendly environment that brings communities together has won over a loyal and growing base of guests that clamor for the brand in their communities. There are currently more than 343 Huddle House restaurants across the United States with an additional 47 in development. For more information on Huddle House, visit huddlehouse.com. Committed to serving “Any Meal, Any Time,” Huddle House restaurants have become icons in the communities they serve throughout the country by bringing friends and family together over delicious food, served from the heart. The core values on which the brand was founded – serving freshly prepared, quality home-style food in a warm, friendly environment that brings the community together – are as true today as they were when it was founded 52 years ago. Today, the brand has 343 locations open and an additional 47 in development. 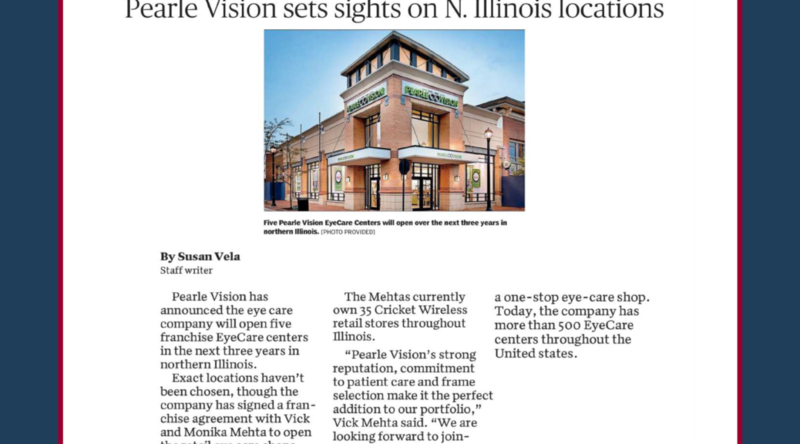 DOWNERS GROVE, Ill. – Pearle Vision, a national premium eye care brand, announced today it has signed an area development agreement for the northern section of Illinois with Vick and Monika Mehta, experienced, multi-unit business owners and longtime residents in the region. The agreement includes the opening of five new EyeCare Centers in the next three years across Boone, Dekalb, Kane, Kendall, McHenry and Winnebago counties. Pearle Vision’s area development program grants large territories to qualified candidates to develop and open EyeCare Centers of their own. This type of development program allows for steady and predictable growth in a specific territory with one team, meaning quality and brand values remain protected. Earlier this year, Pearle Vision signed area development deals in Florida and Arizona. Pearle Vision, which pledges “Nobody Cares for Eyes More Than Pearle,” prides itself on delivering exceptional care to patients that goes beyond a routine eye exam. The brand’s franchisees ensure each patient receives personalized, quality care that takes the whole individual into account. Additionally, Pearle Vision provides patients with everything necessary for healthy vision including a vast selection of high quality frames and contact lenses and state-of-the-art eye care examinations. In addition, Pearle Vision accepts a variety of managed vision care programs to ensure patients can use their benefits for all of their eye care needs. Being a Pearle Vision franchisee offers distinct advantages. The brand’s operating model, eyecon, is designed to maximize efficiencies at each Pearle Vision EyeCare Center – including a turnkey supply chain, is one element that is paving the way for the brand’s emergent franchise growth. Along with eyecon, Pearle Vision’s local marketing approach, provides franchisees the support to attract and retain patients and customers. The digital component of the brand’s marketing package includes online exam scheduling, which has accounts for 25 percent of Pearle Vision franchisees’ patient scheduling. Likewise, Pearle Vision distinguishes itself in the marketplace with the sway of immense buying power on its side, bridging relationships with the most well-known name brands in eyewear and managed vision care, maintaining tight connections with lens and contact lens manufacturers and providing access to state-of-the-art equipment at favorable price points. Pearle Vision aims to expand with qualified franchisees and area developers that embody a contagious entrepreneurial spirit and who have a deep appreciation for following the brand’s processes and systems. The franchise opportunity has been designed to meet the needs of today’s individual optometrists, independent practices owners and investors. For more information on franchising opportunities, visit ownapearlevision.com. Pearle Vision was founded in 1961 by Dr. Stanley Pearle, who began the concept of one-stop, total eye care with the opening of the Pearle Vision Center in Savannah, Ga. Dr. Pearle combined complete eye exams with an extensive selection of eyewear. In 1981, Pearle Vision began offering franchise opportunities to select doctors and opticians. Today, with more than 500 EyeCare Centers located throughout the United States, Canada and Puerto Rico, Pearle Vision is built around a doctor-centered business model with a primary focus to deliver genuine eye care to patients and become the neighborhood trusted source for all their eye care and eye wear needs. Pearle Vision is owned by Luxottica, a leader in premium fashion, luxury and sports eyewear. For more information, visit http://www.PearleVision.com. And, to learn more about the Pearle Vision franchise opportunity, visit ownapearlevision.com or call 1-800-PEARLE-1. ATLANTA – Huddle House has hit refresh on an American classic. The nation’s iconic neighborhood restaurant has rolled out a completely overhauled burger menu. The new burger line, named Big House® Burgers and Melts, highlights quality ingredients to help Huddle House deliver on its mission of bringing friends and family together over delicious food, served from the heart. HuddleBurger® – Served on a toasted brioche bun, this mouthwatering burger consists of two seasoned patties stacked in between two pieces of cheddar cheese. Upgrade this burger with bacon or two more patties to make it a “Triple”. Classic Patty Melt – Melted together on Texas toast, this melt is served with grilled caramelized onions, garlic mayo, two seasoned burger patties and American cheese. Double Mushroom Swiss – Loaded high with a mix of sautéed mushroom and caramelized onions, this burger is served with breaded friend onion rings, Swiss cheese and two beef patties. Mega Bacon Cheeseburger – Crafted with the bacon lover in mind, this burger is made with two layers of bacon and cheddar cheese sandwiched between two burger patties. Black Bean Burger By Gardein™ – A delicious meat-less burger made from black beans layered between a grilled and buttered brioche bun and melted cheddar cheese. All Big House Burgers and Melts are served with the choice of French fries, sweet potato fries, tater tots and newly introduced seasonal fresh fruit. Fresh fruit will also be available to guests a la carte and include cantaloupe, grapes and pineapple as well as rotate in seasonally appropriate fruit. 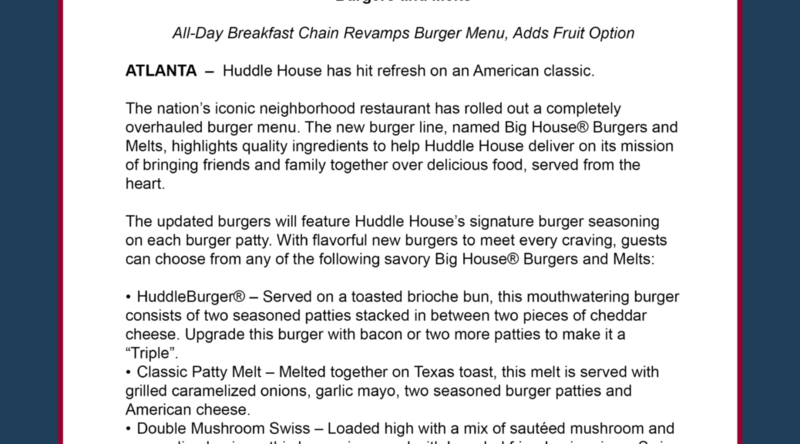 The new menu additions are available at all 400 Huddle House restaurants across the country. For more information on Huddle House’s flavorful menu or to find a location near you, visit http://www.huddlehouse.com/. Committed to serving “Any Meal, Any Time,” Huddle House restaurants have become icons in the communities they serve throughout the country by “Bringing Friends and Family Together, Over Delicious Food, Served from the Heart”. The core values on which the brand was founded – serving freshly prepared, quality home-style food in a warm, friendly environment that brings the community together – are as true today as they were when it was founded 54 years ago. Today, the brand has more than 400 locations open or in development. Named one of the Top 200+ Franchises by Franchise Times and ranked among Thrillist’s list of “Regional Breakfast Chains that Should Be Everywhere,” Huddle House continues to be adored in each of the markets it serves. All Points PR secured press coverage with The Orange County Register for client Cinnaholic. 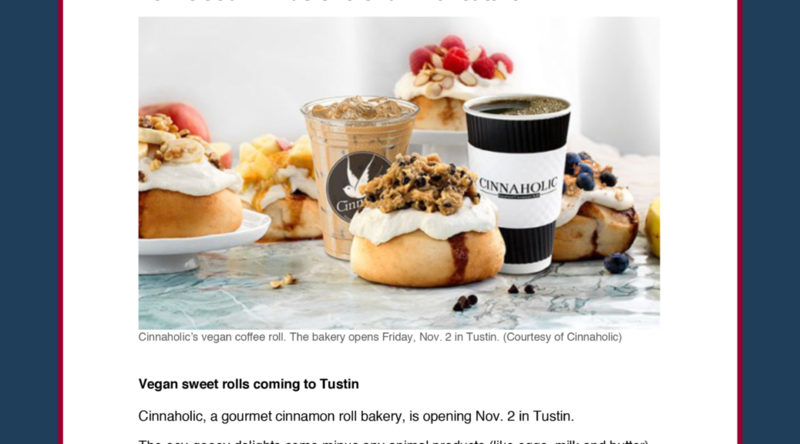 The article featured the franchise as the lead in their restaurant-retail roundup, sharing the news of the vegan bakery opening soon in Tustin, California. Coverage ran online.